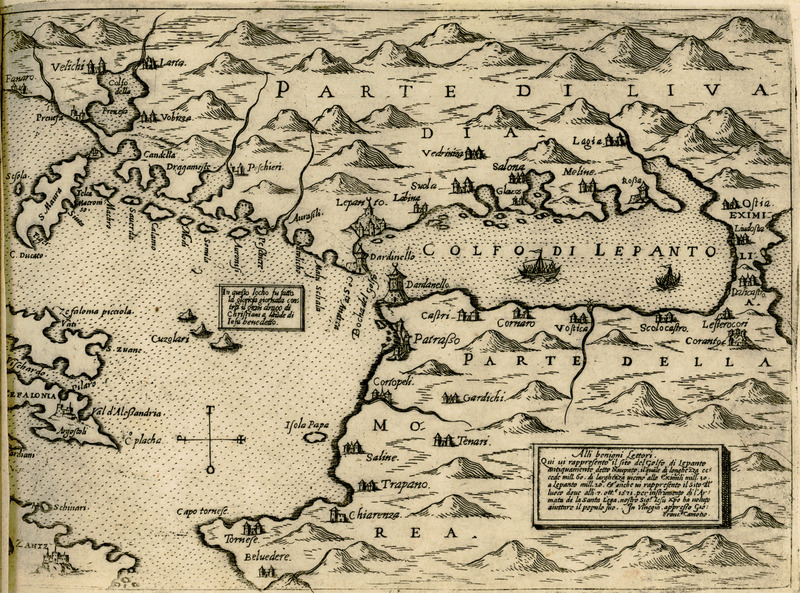 CAMOCIO, Giovanni Francesco. 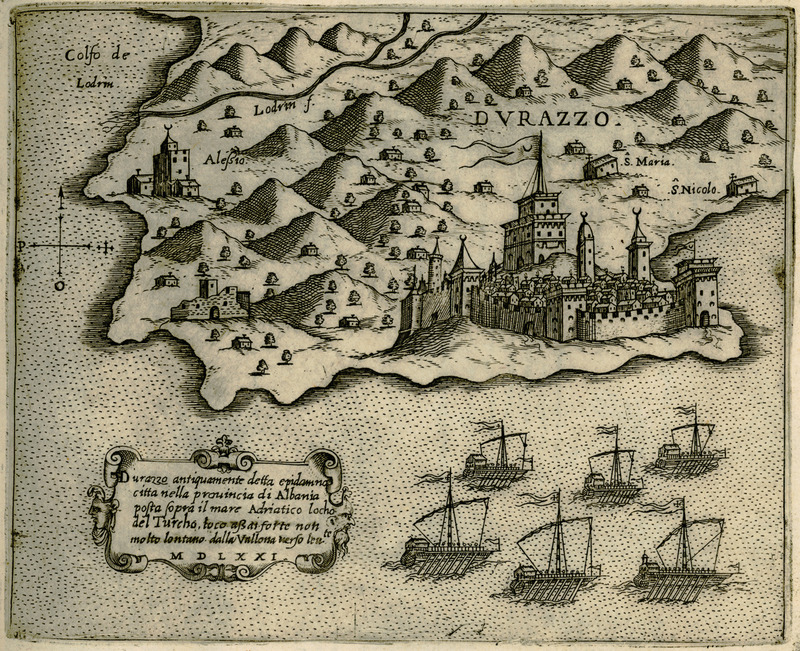 Isole famose porti, fortezze, e terre maritime sottoposte alla Ser.ma Sig.ria di Venetia, ad altri Principi Christiani, et al Sig.or Turco..., Venice, alla libraria del segno di S.Marco [c. 1574]. 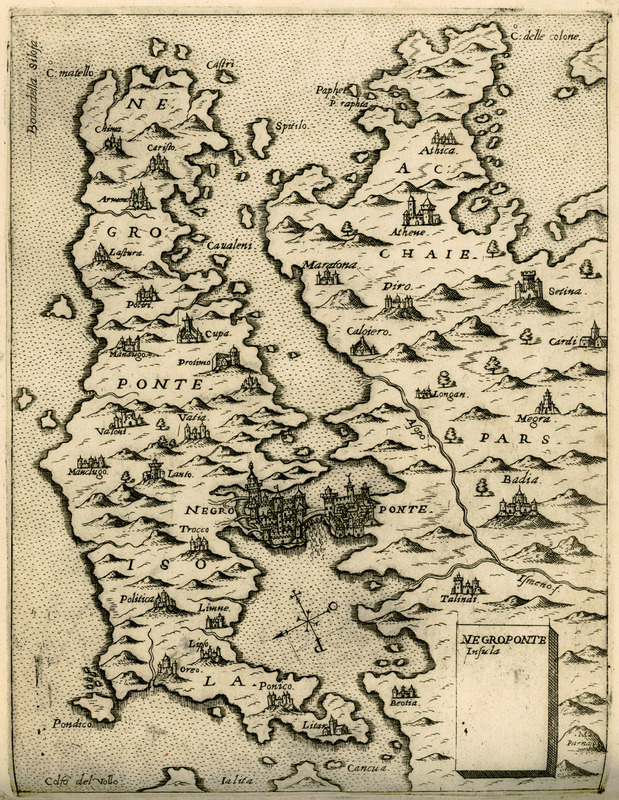 Giovanni Francesco Camocio was a cartographer, publisher and printer. 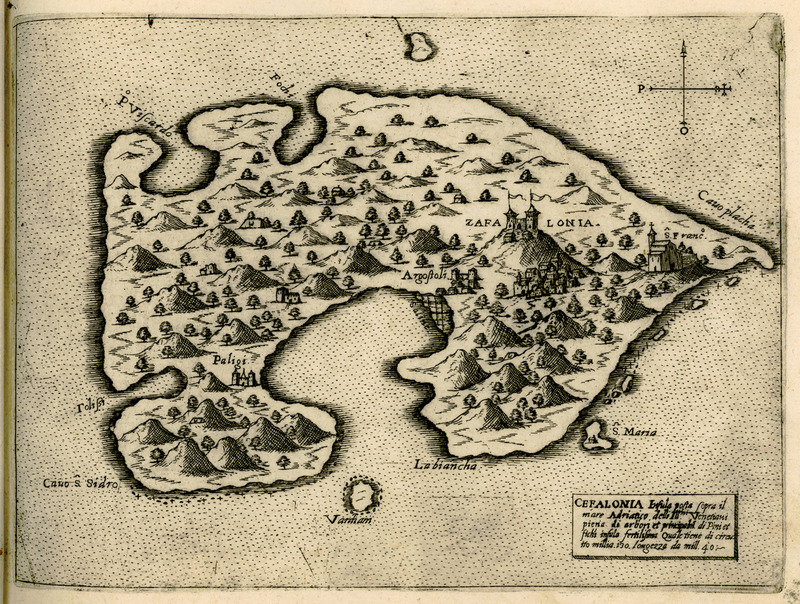 From 1558 onwards, he composed various island maps, which were very thorough and constituted a pioneering work for the era. 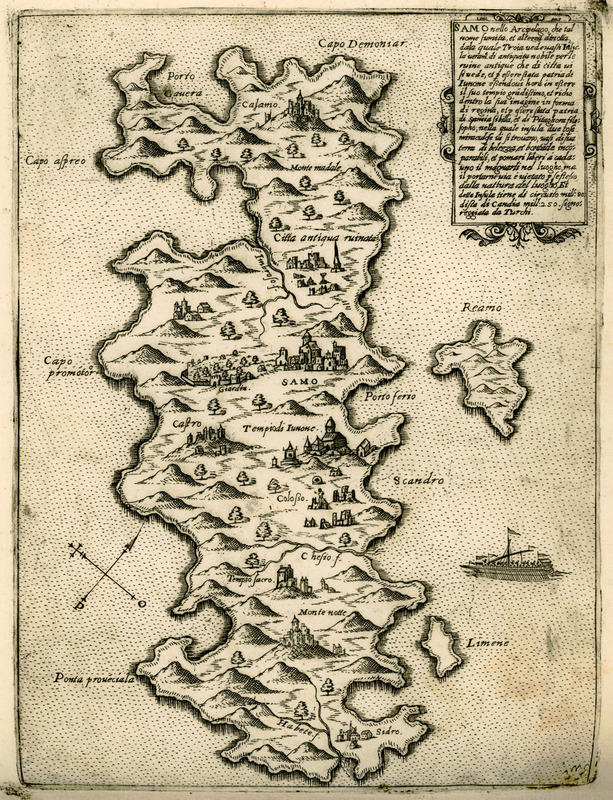 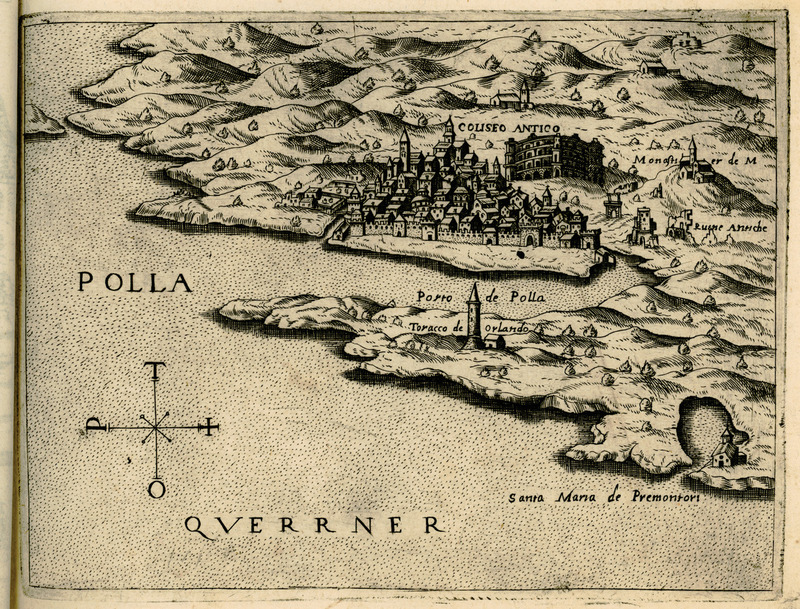 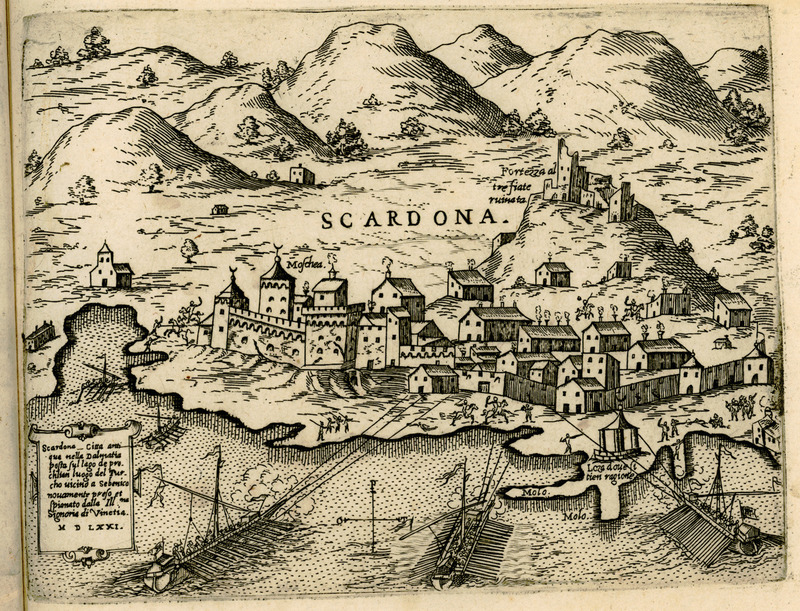 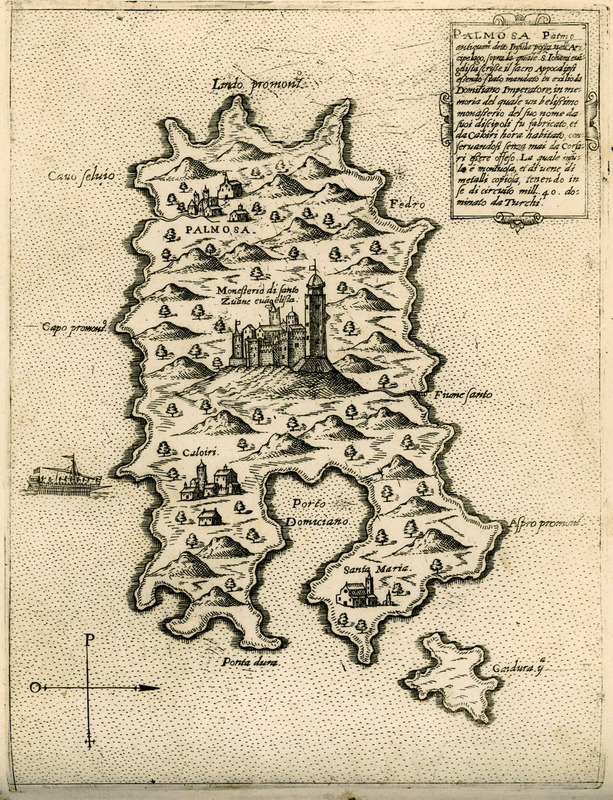 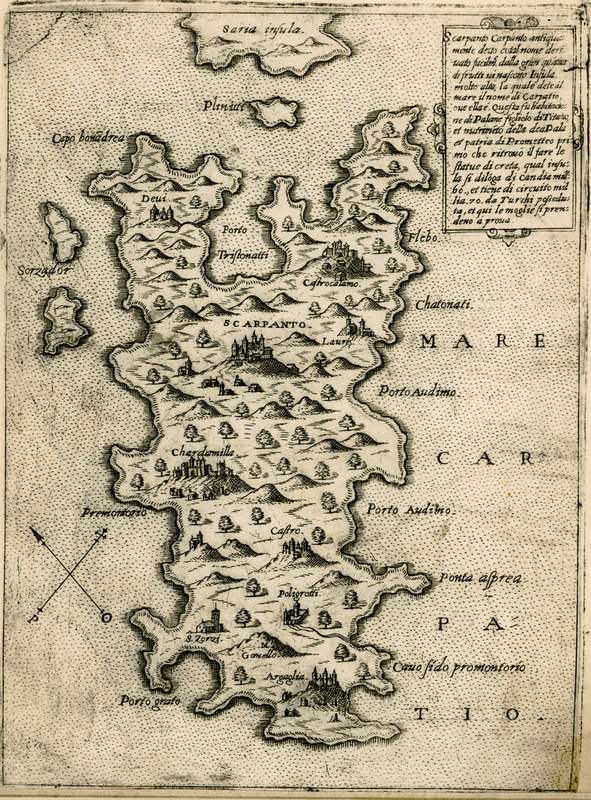 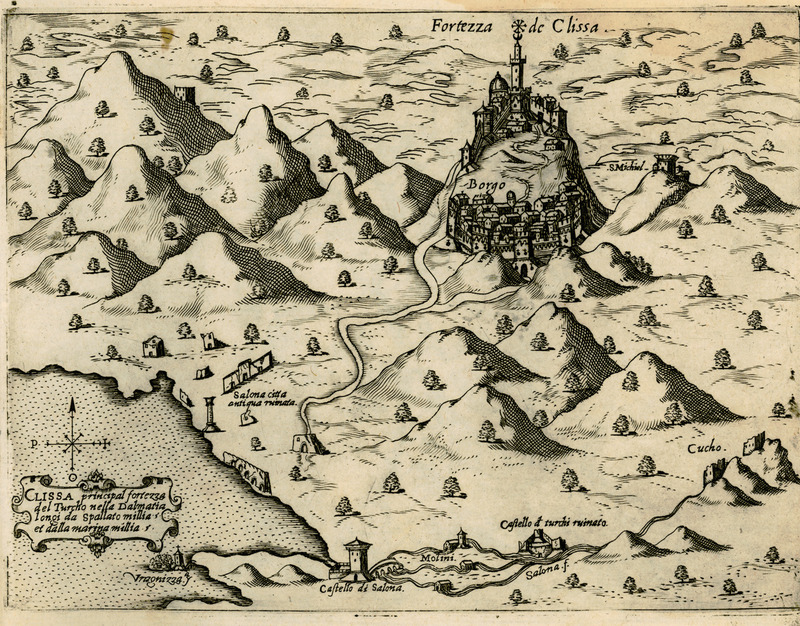 The oldest engraving of this isolario dates from 1566 and the last from 1574. 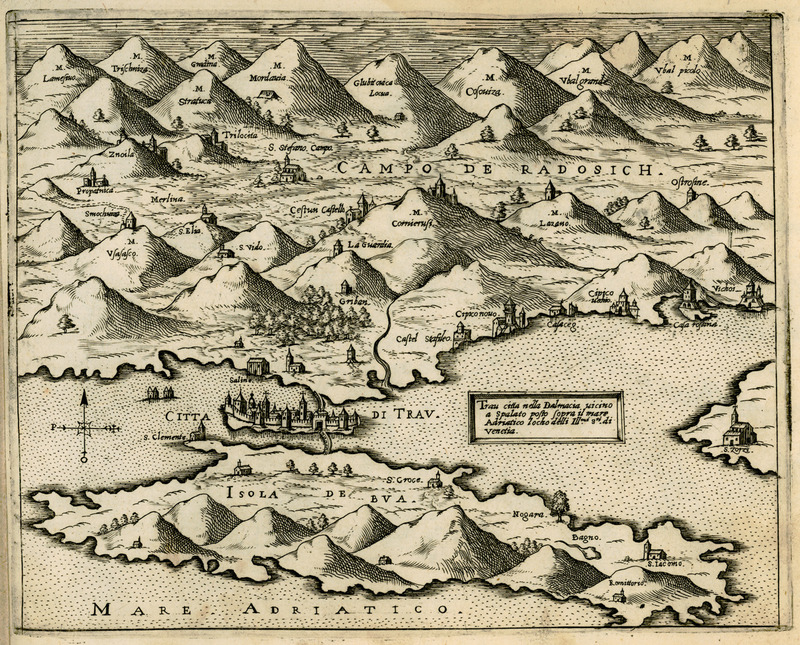 Many of the maps bear Camocio’s name. 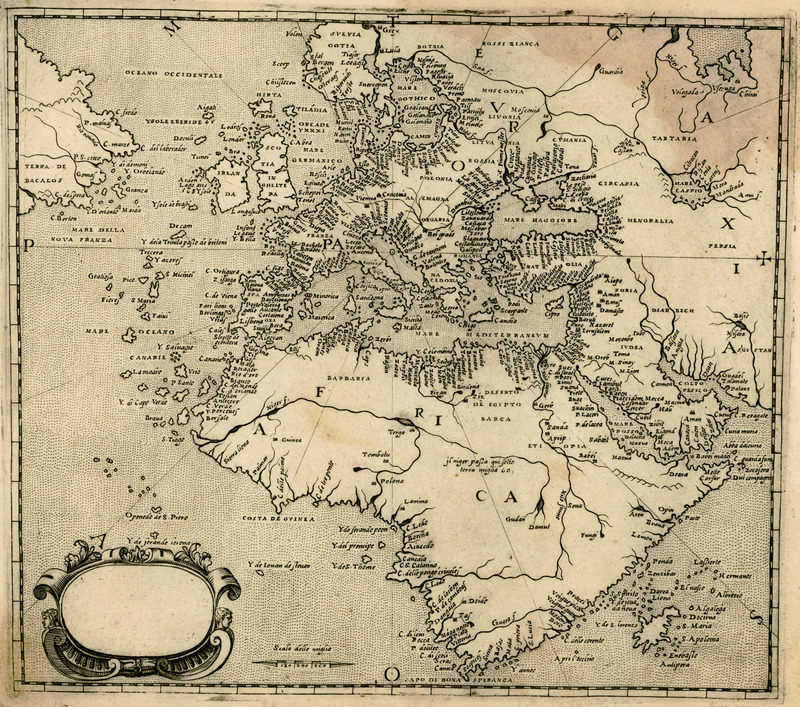 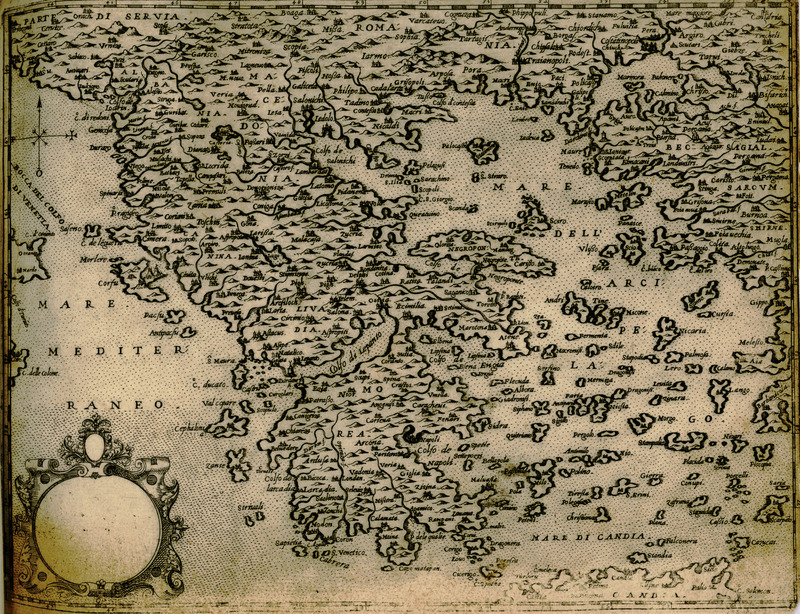 The work was published in various editions from 1571 to 1574, each time with variations in the compilation of maps. 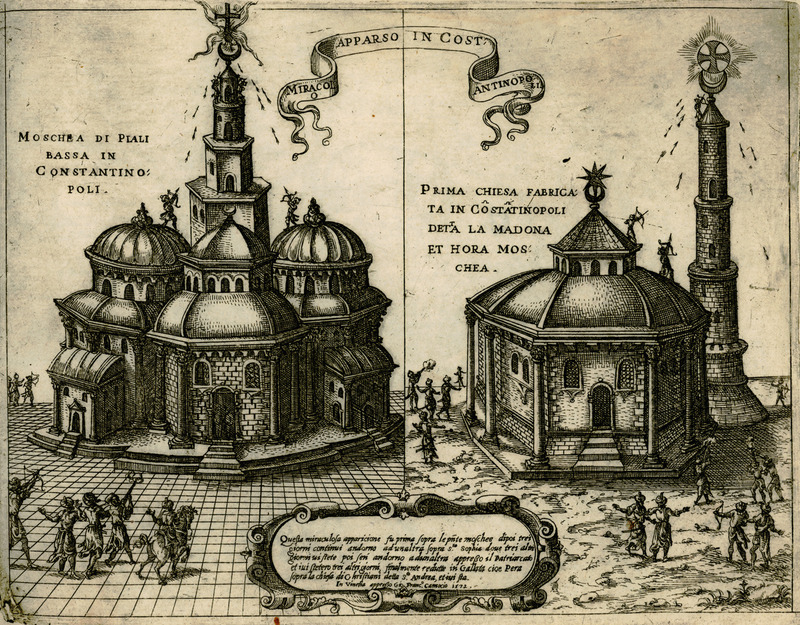 The edition includes views of fortifications and cities and depictions of battles between Christians and Ottomans. 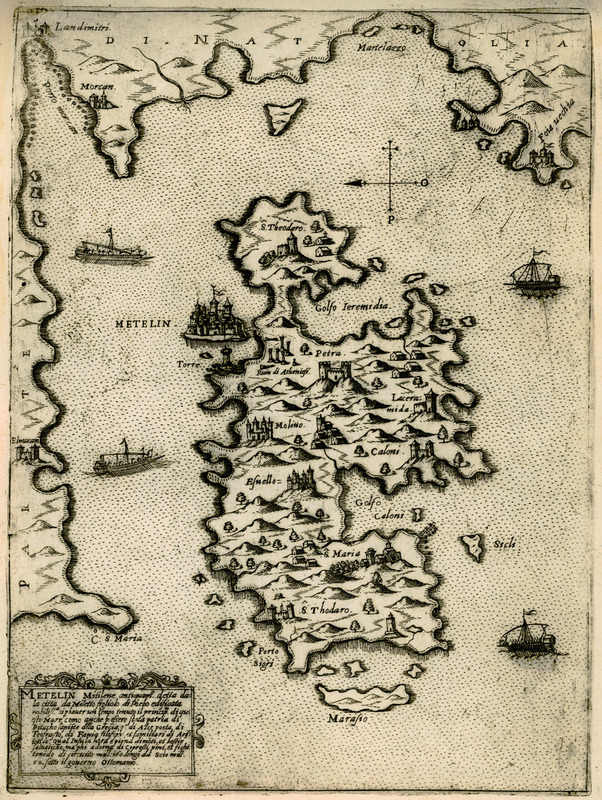 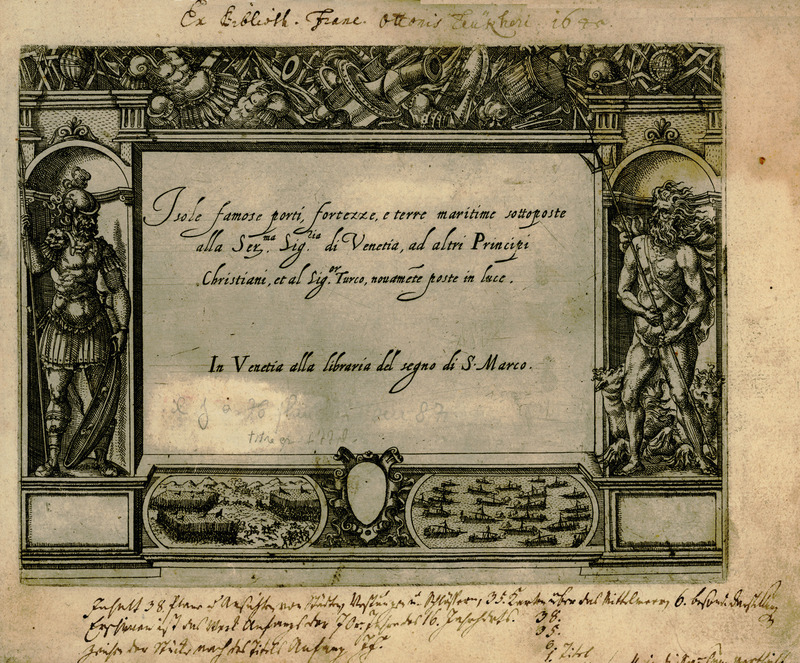 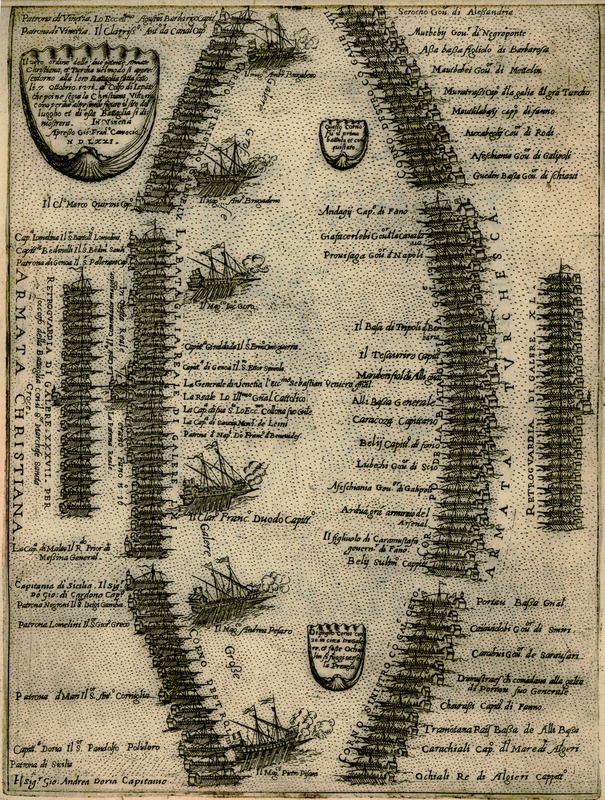 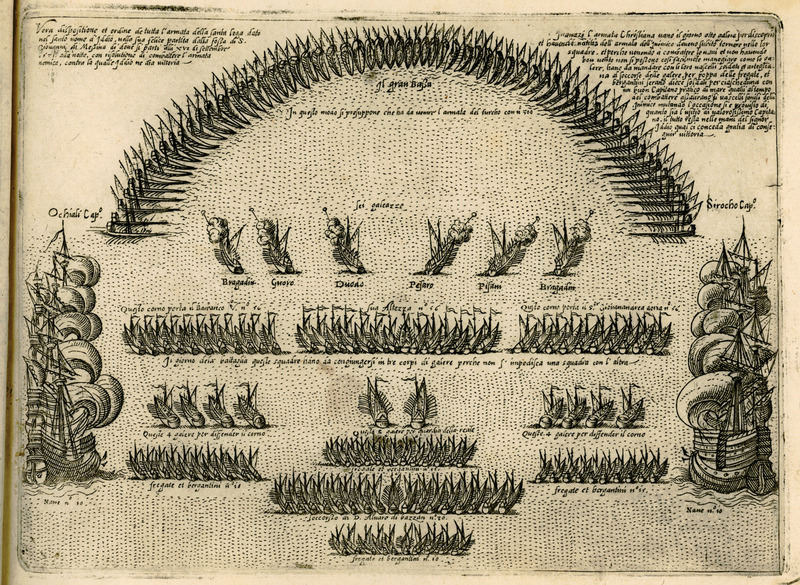 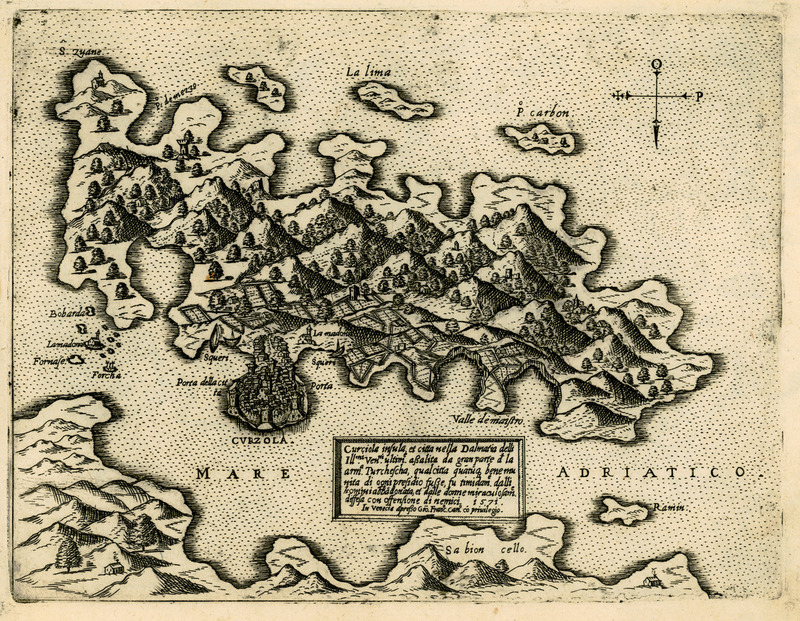 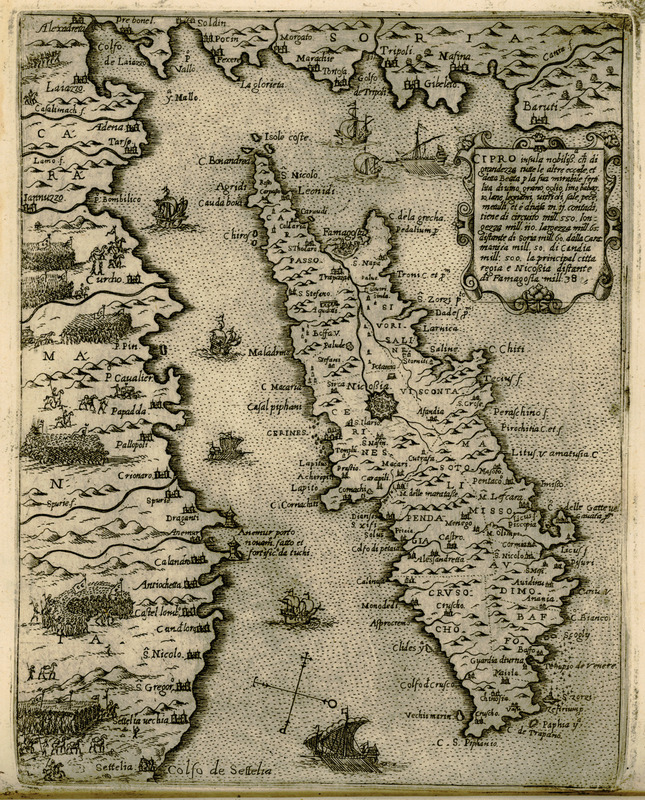 Engravings can be divided into three groups: the first one includes Venetian possessions, islands, the Albanian and Dalmatian Adriatic coast, islands and coasts iof the Ionian sea as well as depictions of sieges and sea battles in those regions. 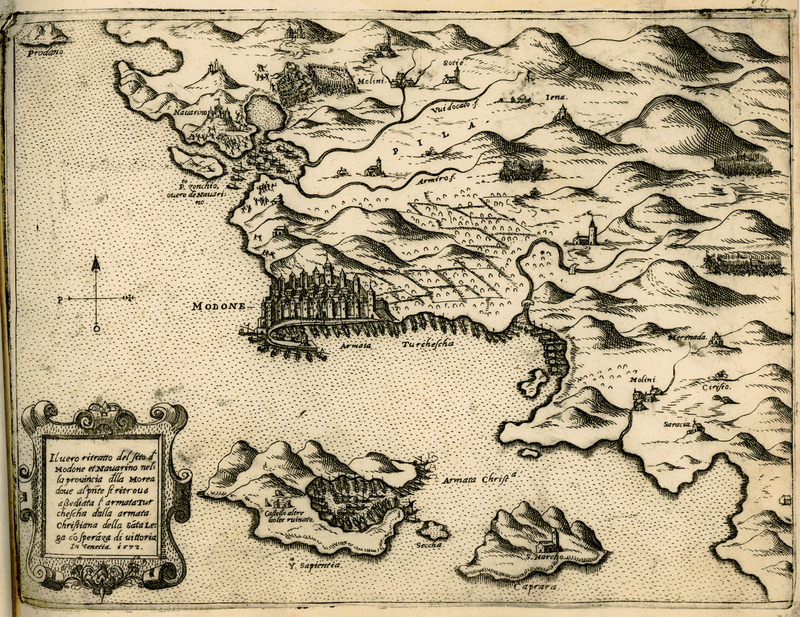 The second group is comprised of islands of the Aegean, mainly those nearer Istanbul and the Bosporus. 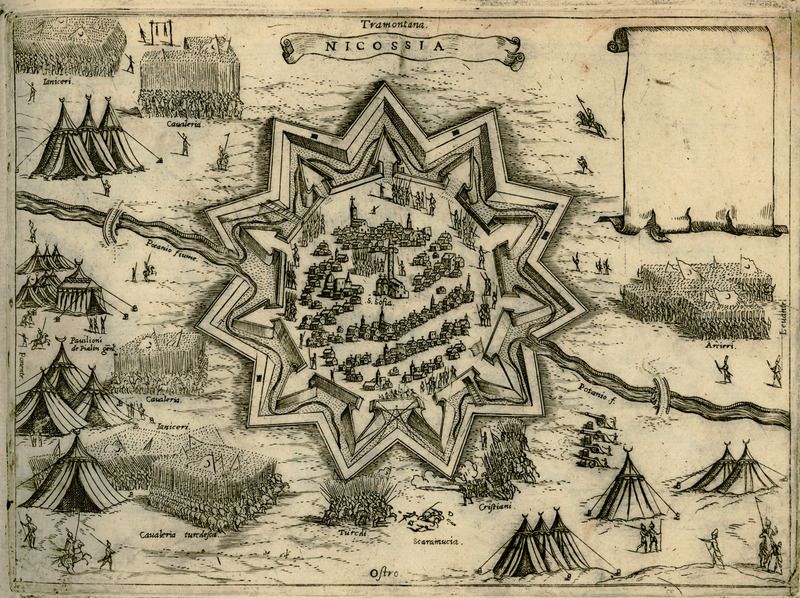 The third group of illustrations depicts Cyprus and the military events that took place on that island, together with a few isolated subjects. 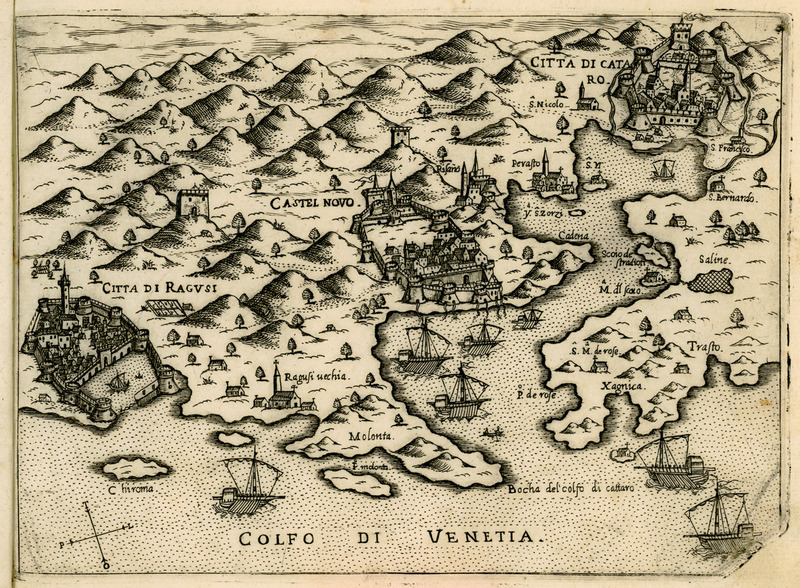 Camocio died in Venice in 1575, probably during the plague epidemic. 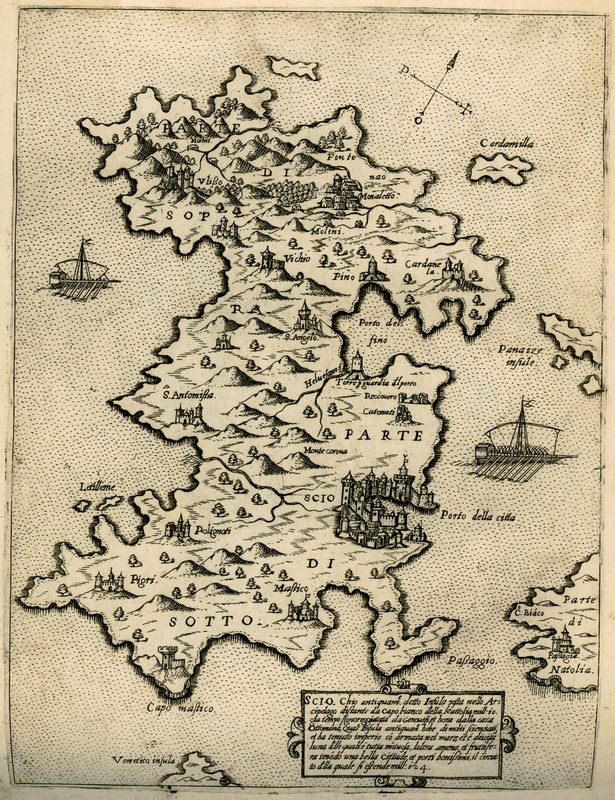 His work was influenced by similar editions by S. Pinargenti (1573) and T. Porcacchi (1572), and in its turn influenced later isolaria such as those by D. Bertelli (1574) and G. Rosaccio (1598). 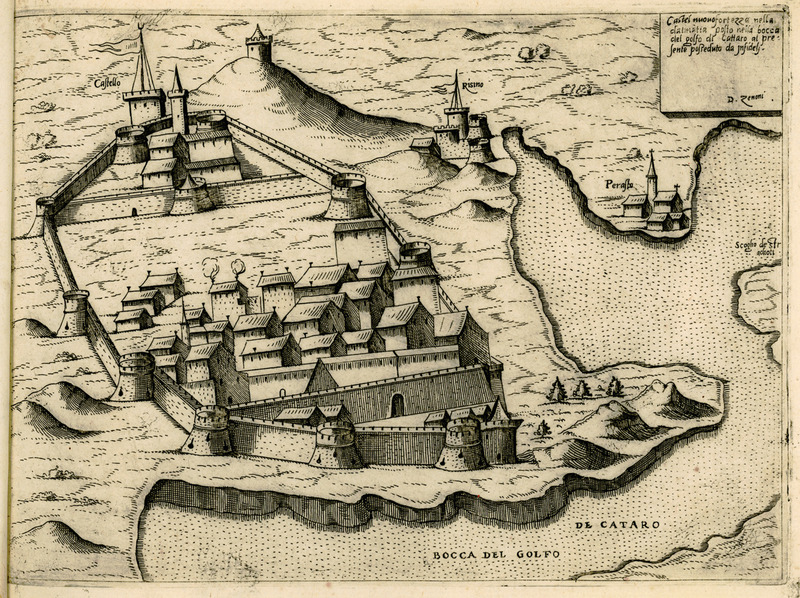 Map of Vienna and its walls, 1566. 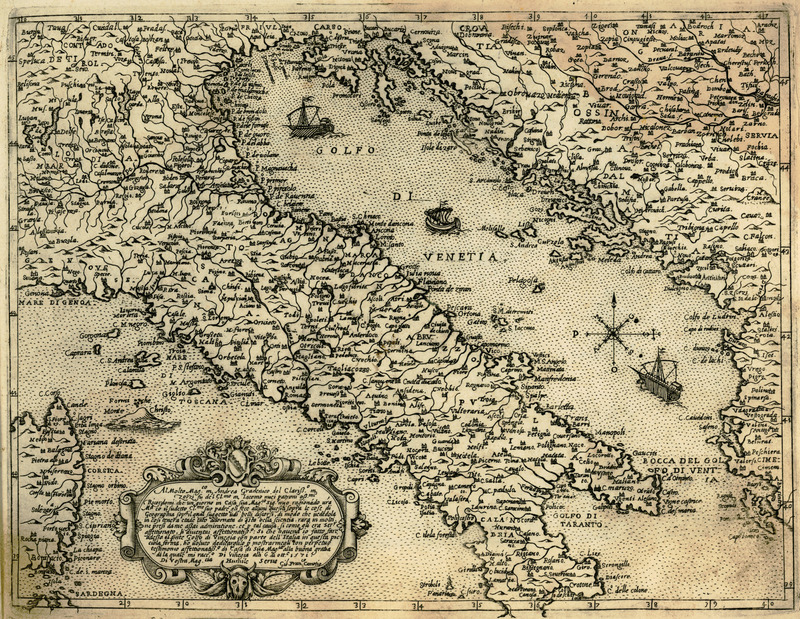 Map of Italy and the eastern coast of the Adriatic Sea. 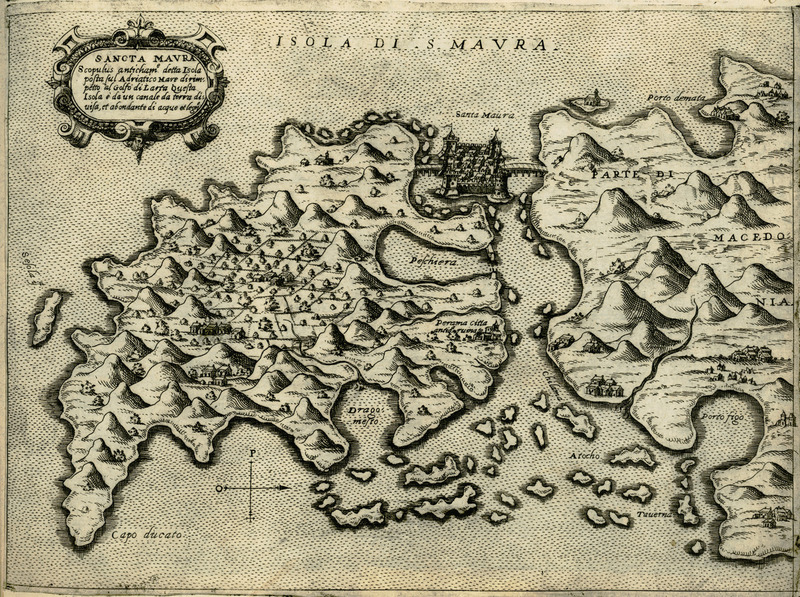 Map of Hvar in Croatia. 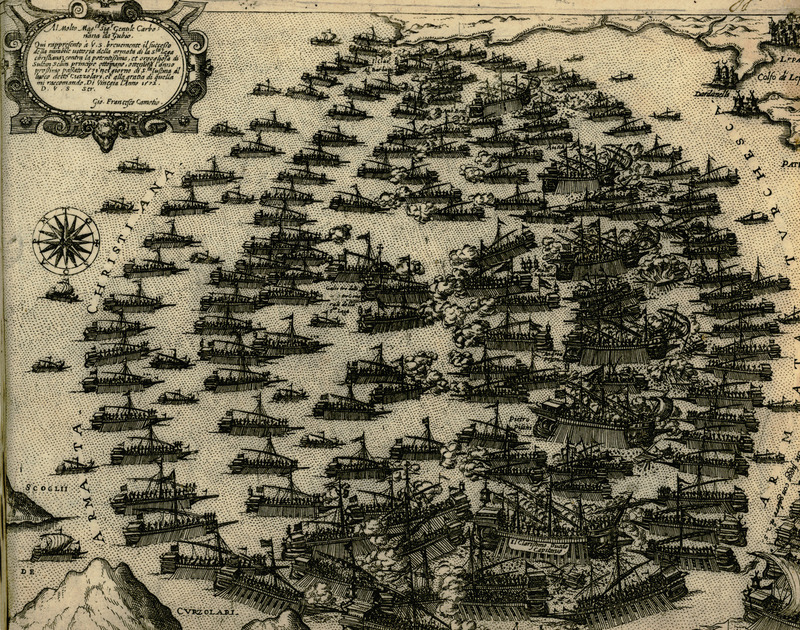 The Ottoman and the Venetian fleet during the Battle of Lepanto in 1571. 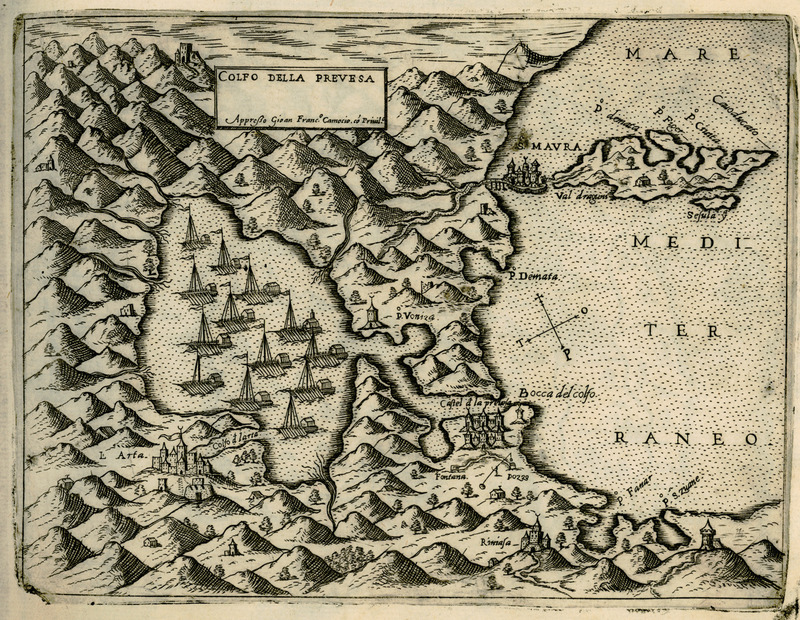 Map of Tunis and Bizerta. 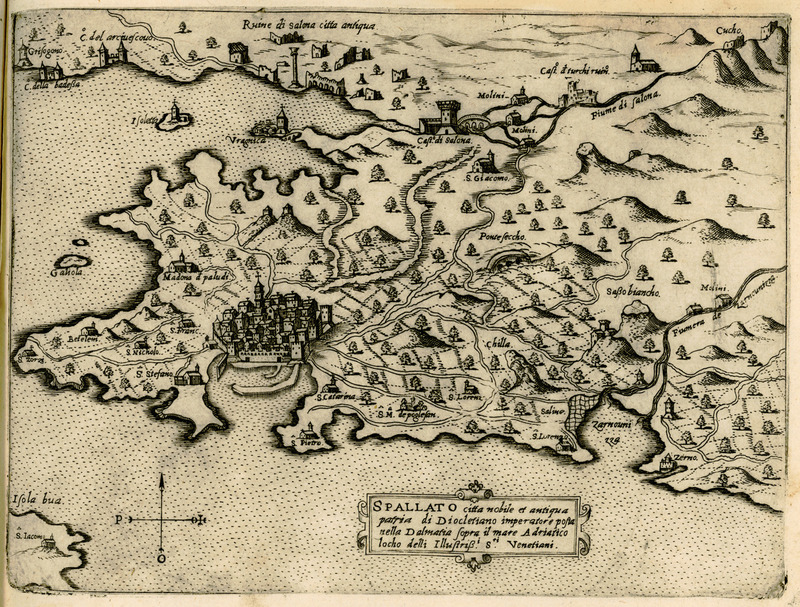 Map of Klis (Cloatia), on which the ruins of Salona (today Solin) are noted. 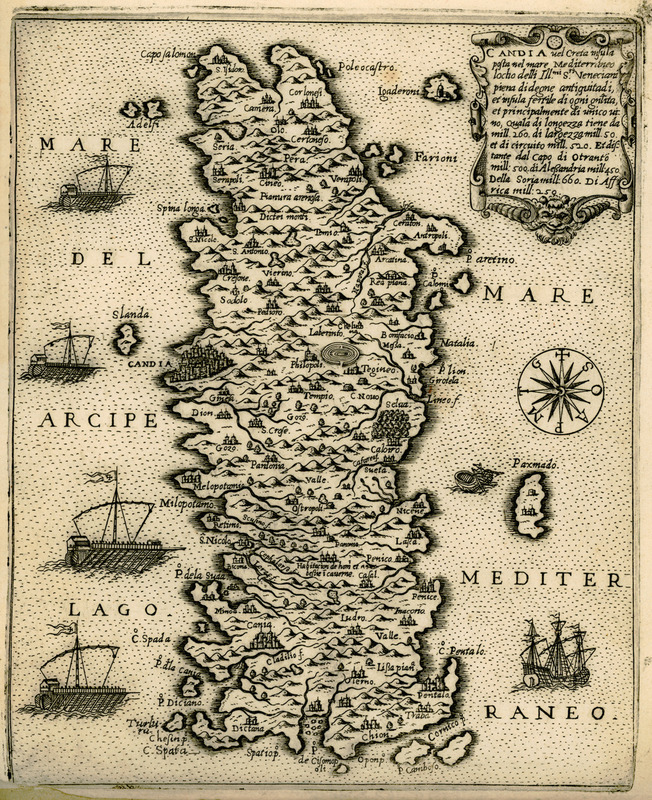 Map of the Ambracian gulf. 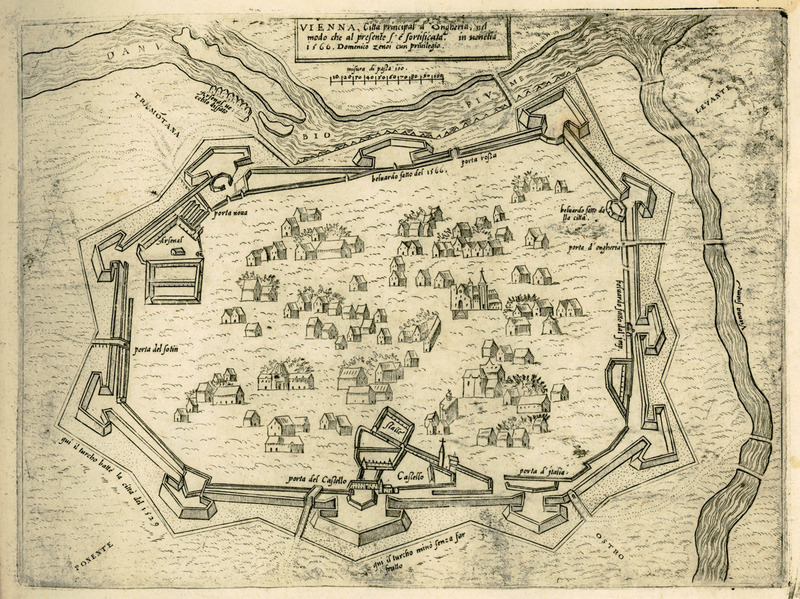 Map of the fortress Makarska in Croatia. 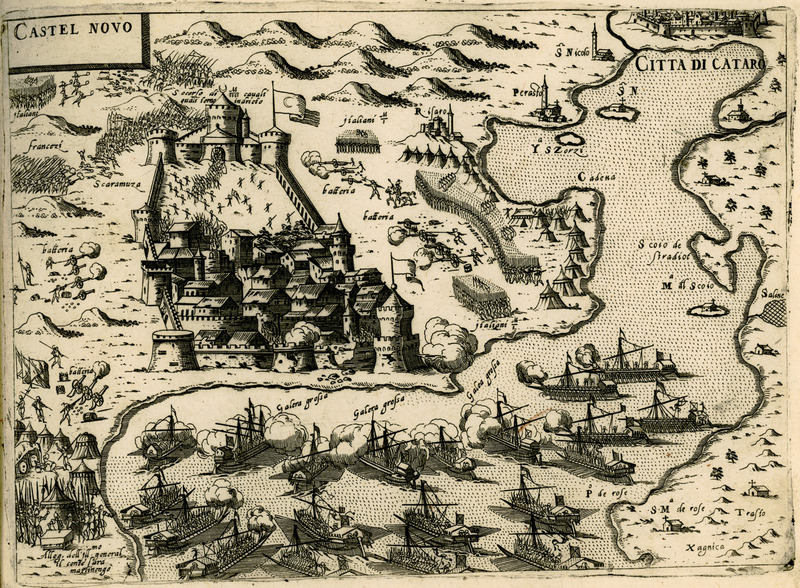 The Ottoman fleet trying to re-capture the city from the Venetians after the Battle of Lepanto in 1571. 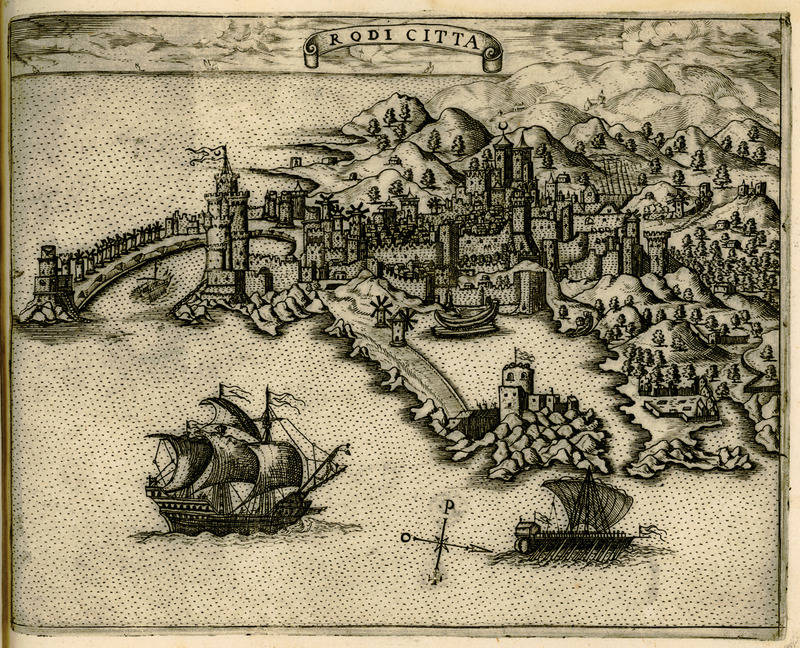 Map of Trogir in Croatia. 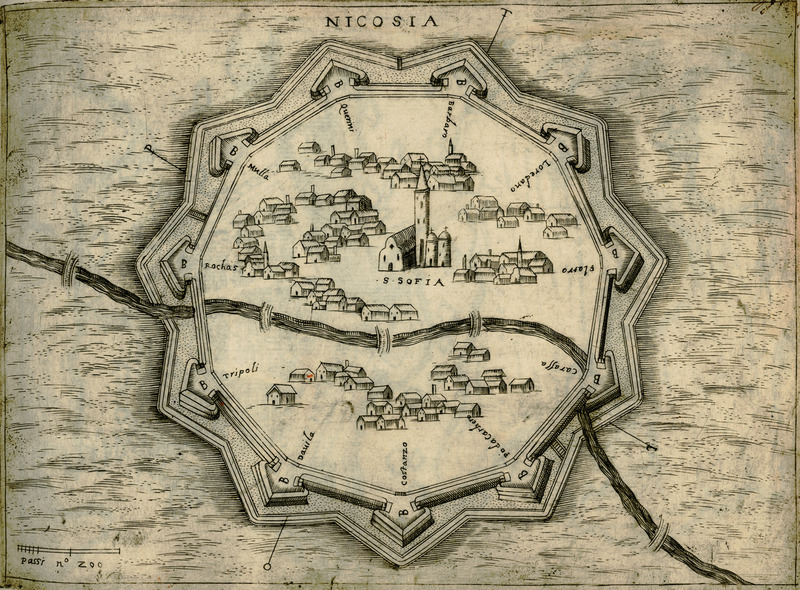 Map of Nicosia, Cyprus, during its siege by the Ottomans (1570). 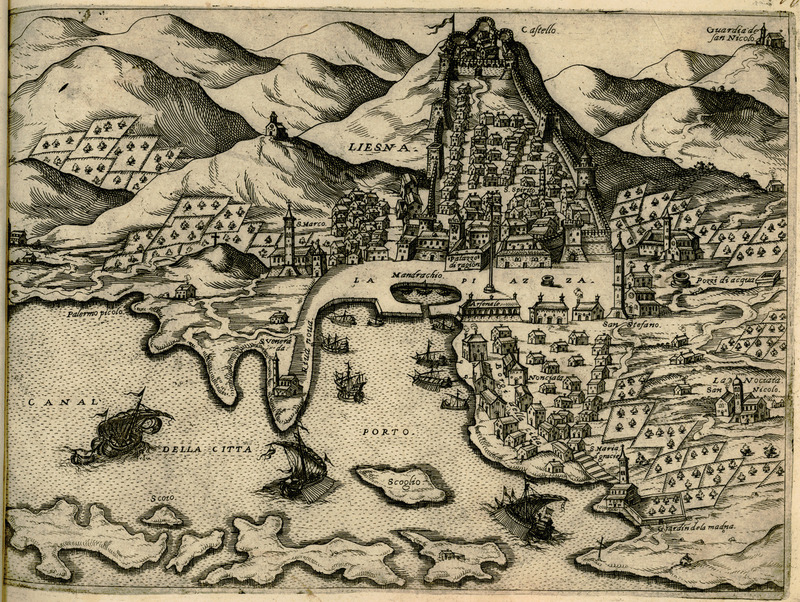 View of Piyale Pasha Mosque and Chora church in Istanbul, possibly during Istanbul during the great storm of July 1490, which caused extended fires and human losses and was seen by several Christians as sign of God's wrath against Muslims. 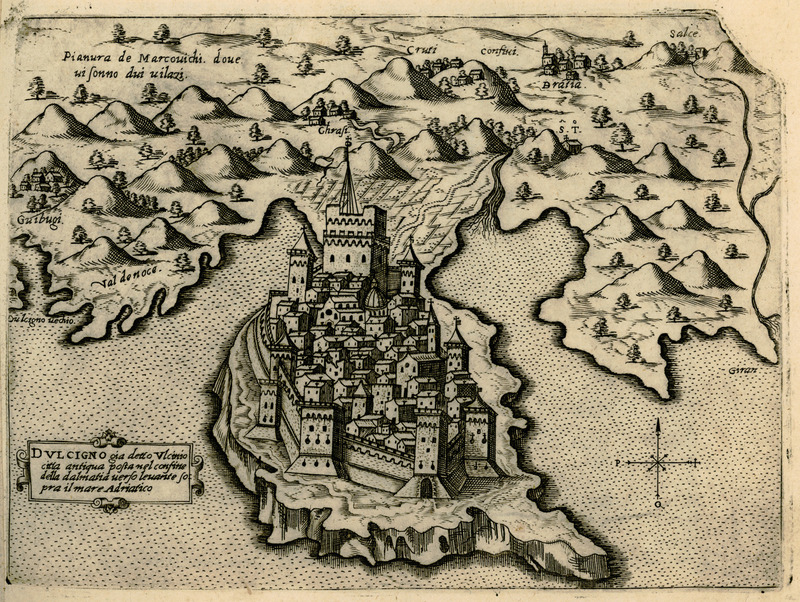 The Castle of Kilitbahir on the Dardanelles. 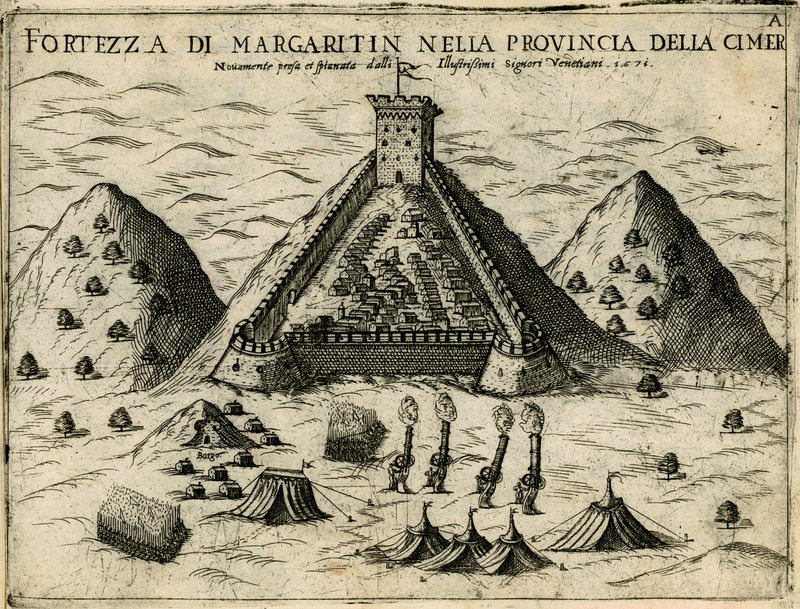 The castle of Ulcinj in Montenegro. 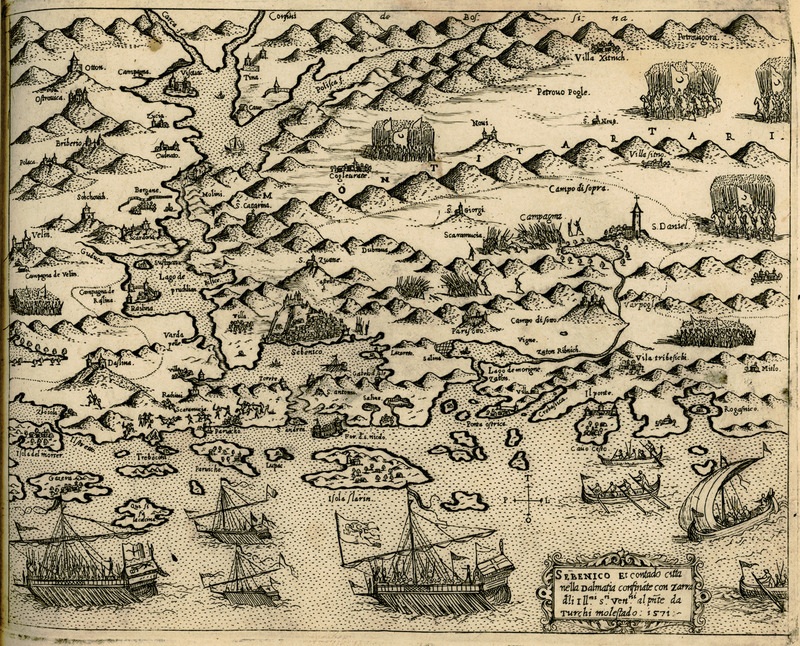 Disposition of the Venetian and Ottoman fleets during the Battle of Lepanto in 1571. 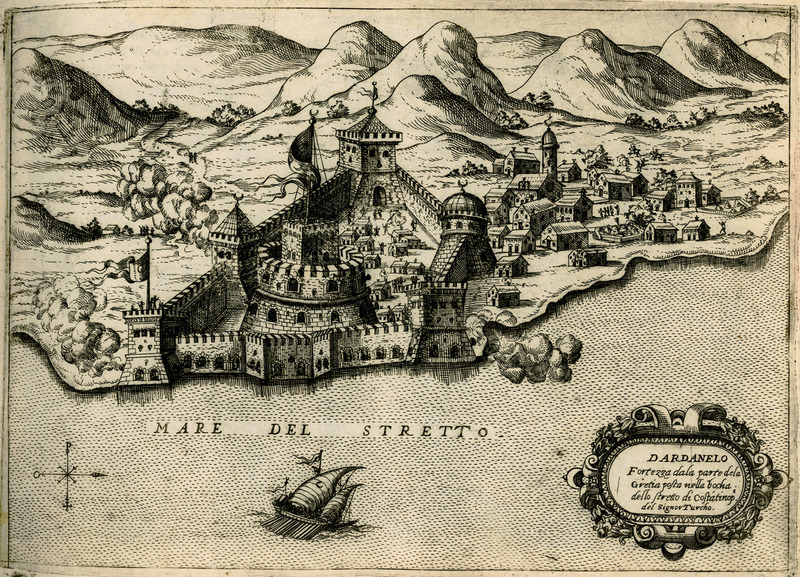 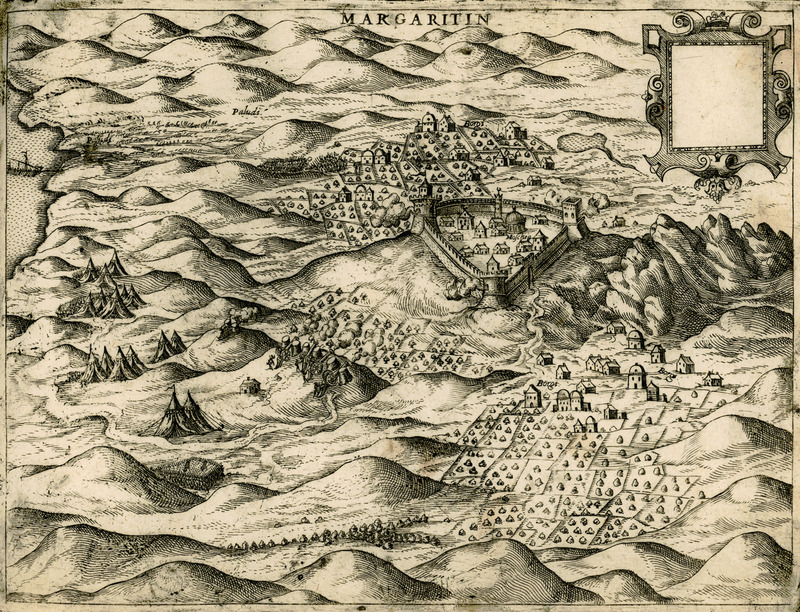 The castle of Margariti under Venetian siege (1571). 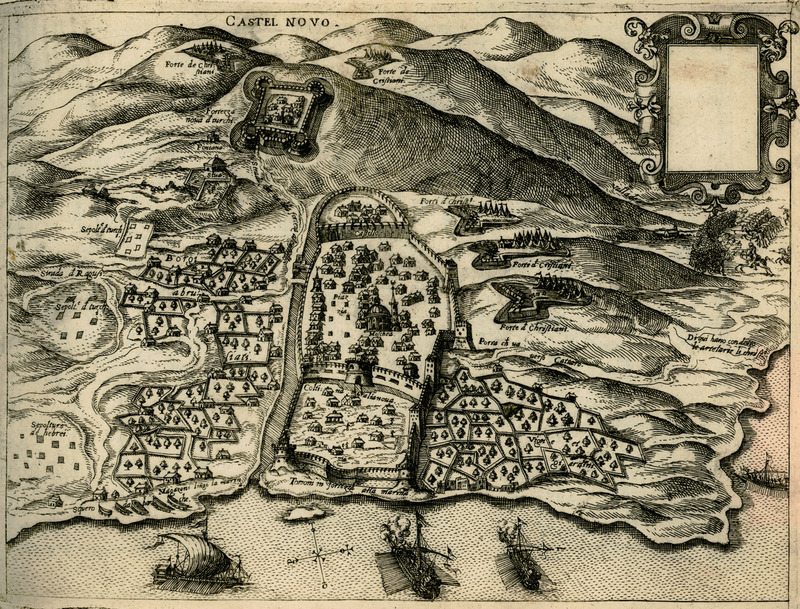 Map of Herceg Novi, showing the fortifications built by the Venetians during the siege of the city by the Ottomans (1539). 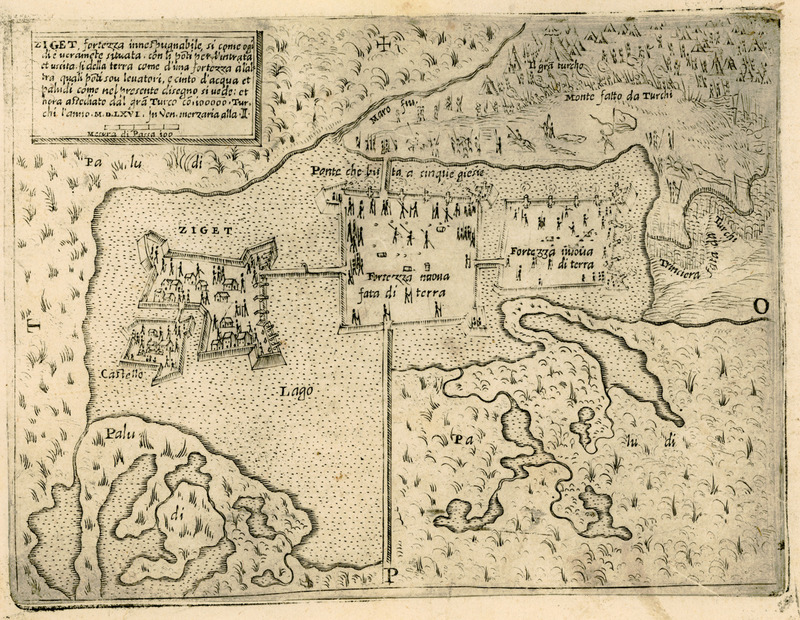 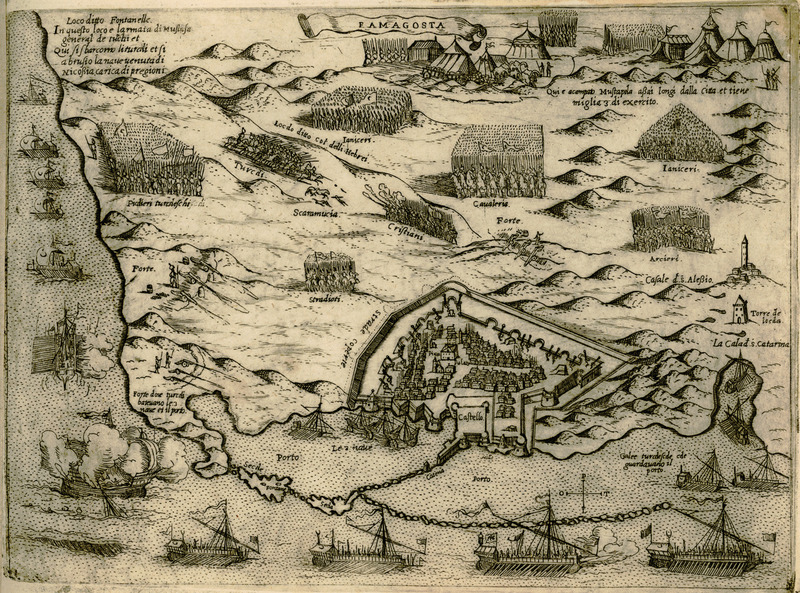 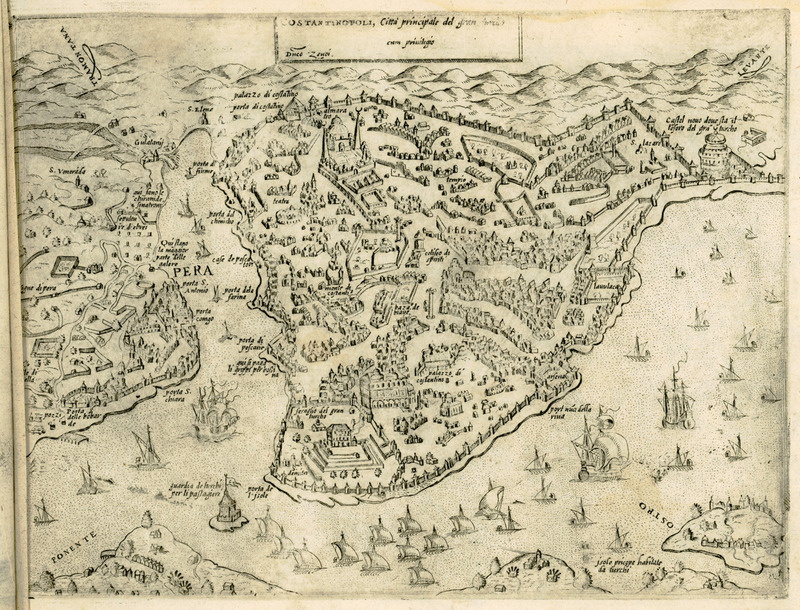 Map of Famagusta during the siege of the city by the Ottomans in 1571. 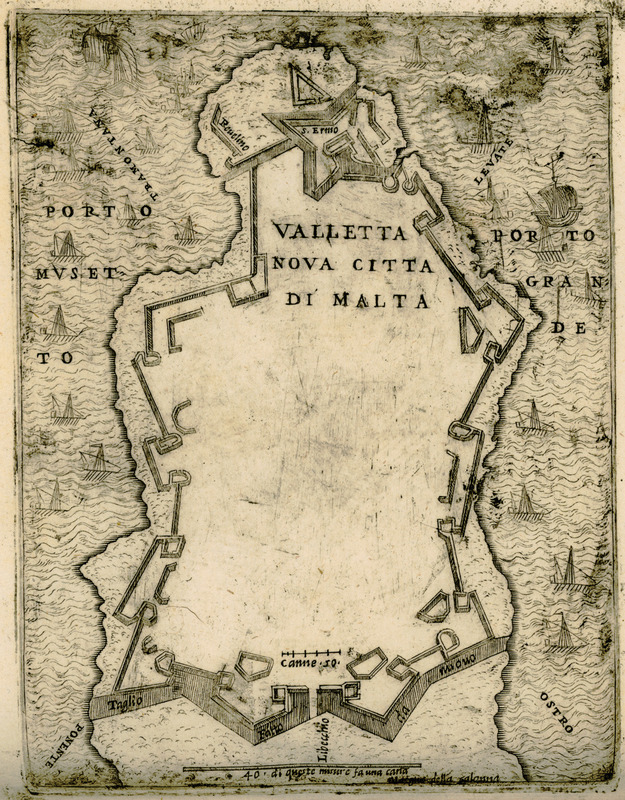 Map of Valletta as rebuilt after the end of the Ottoman siege in 1565. 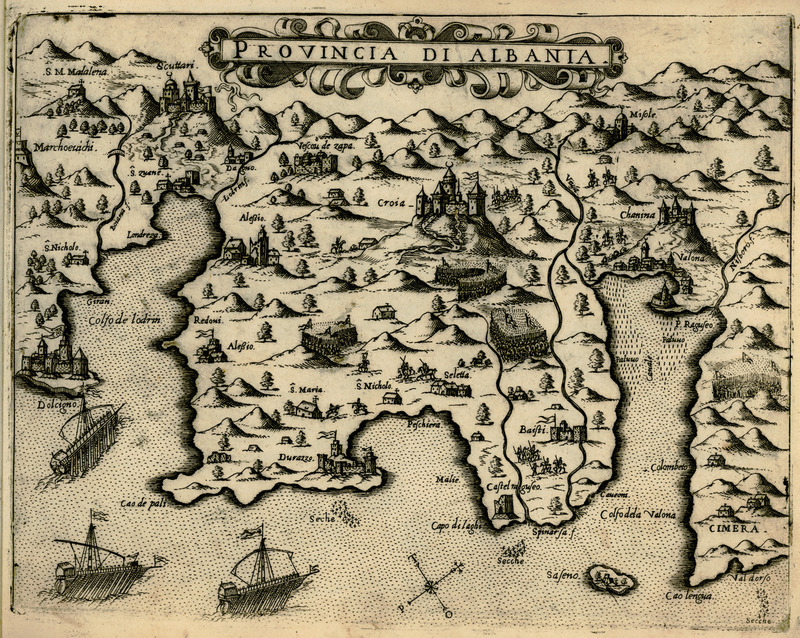 Map of Shkodër and its surrounding area. 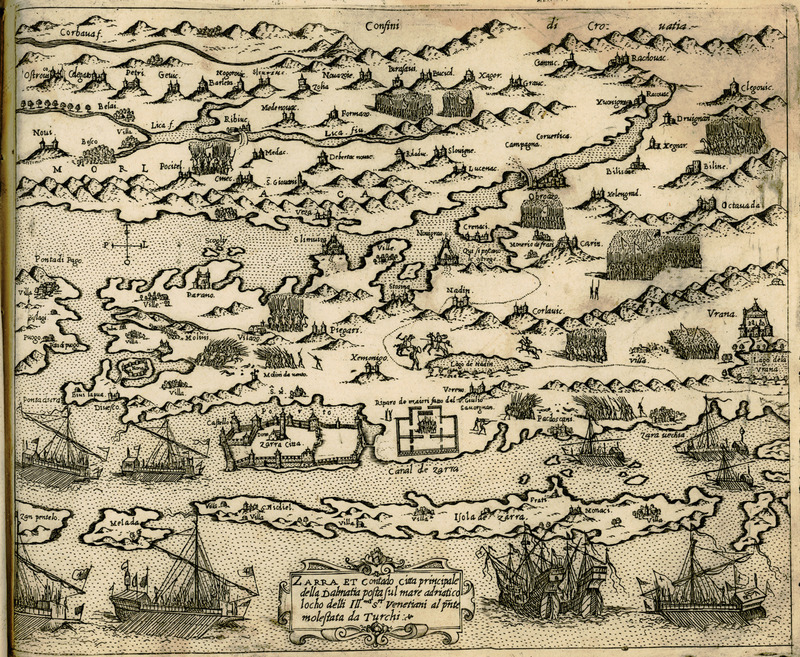 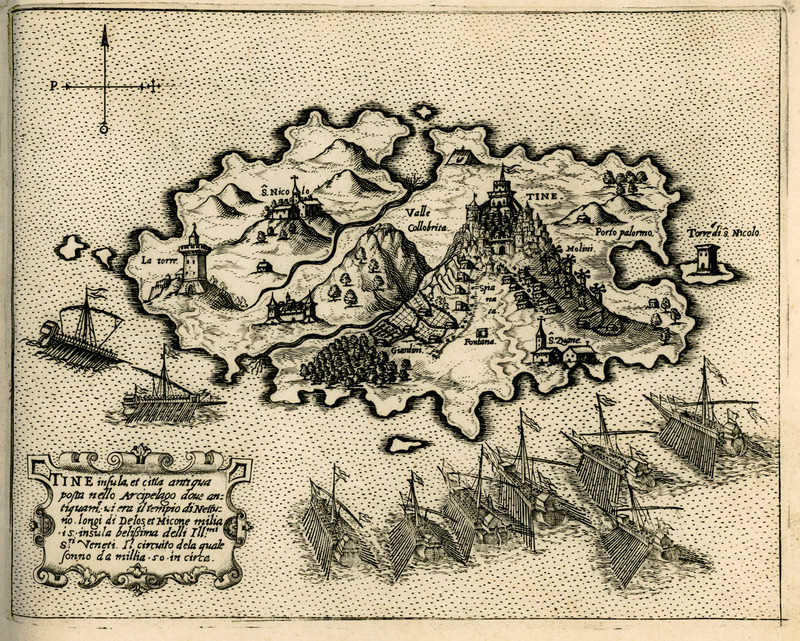 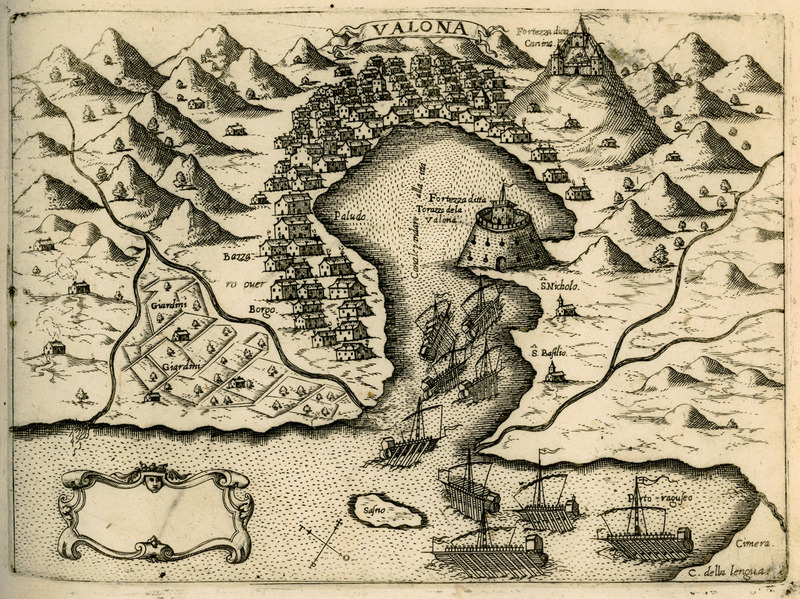 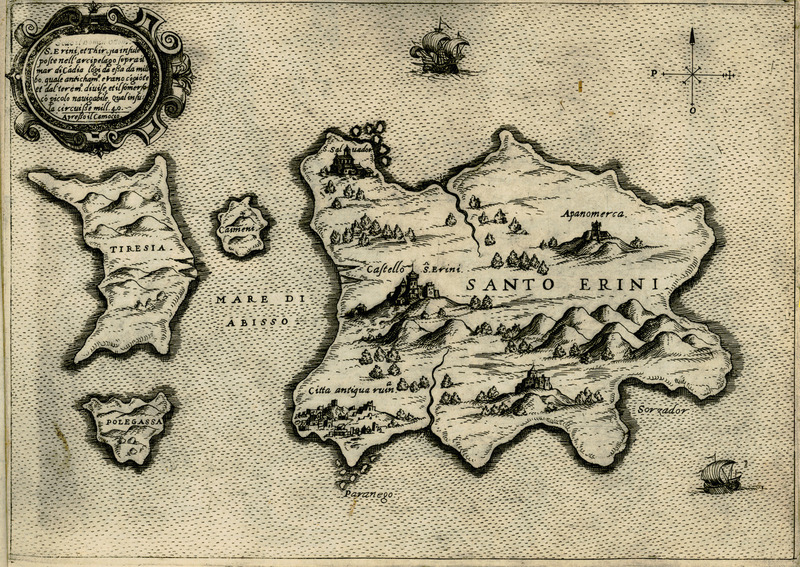 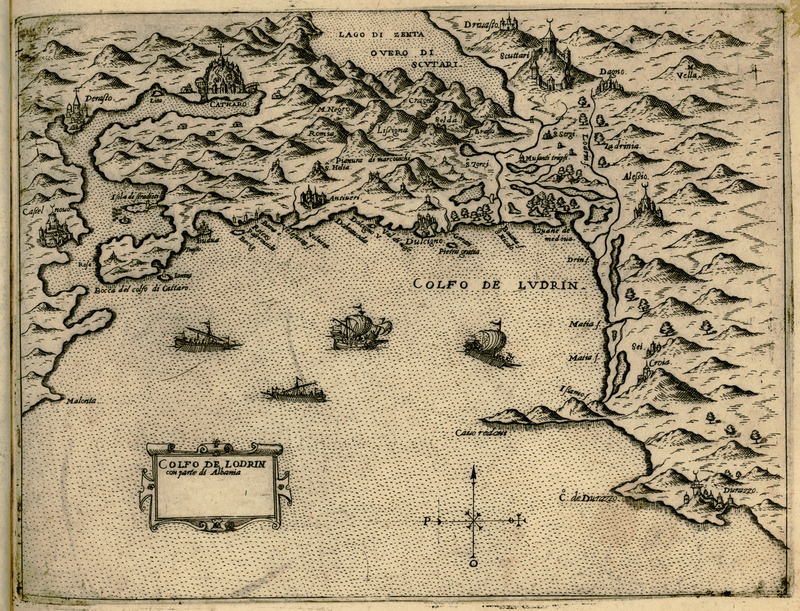 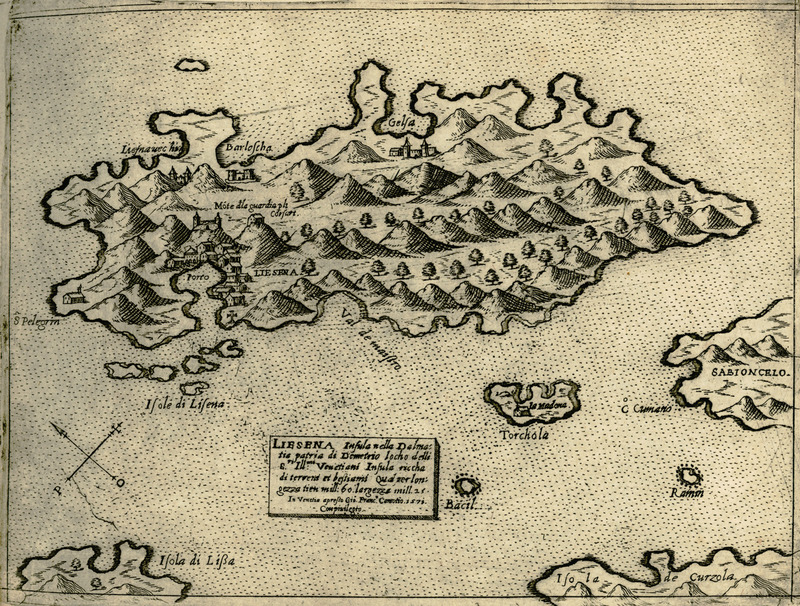 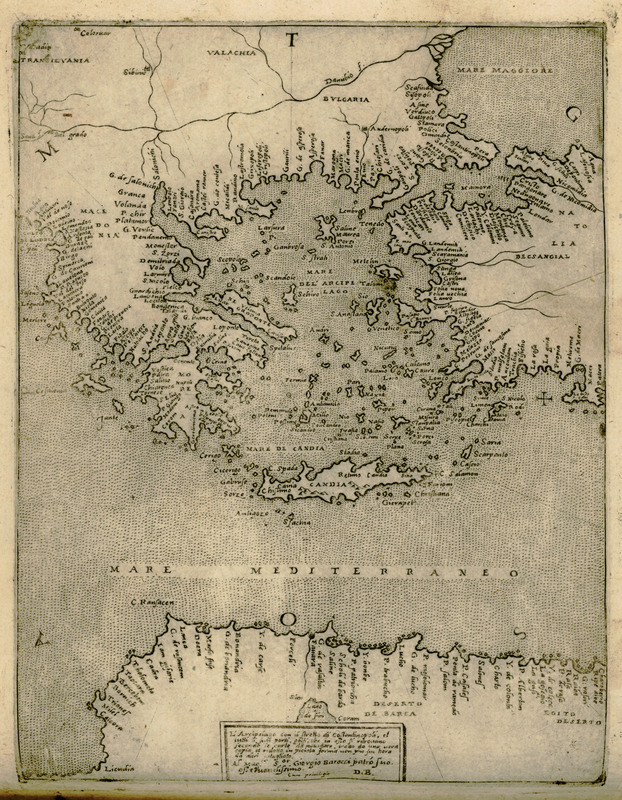 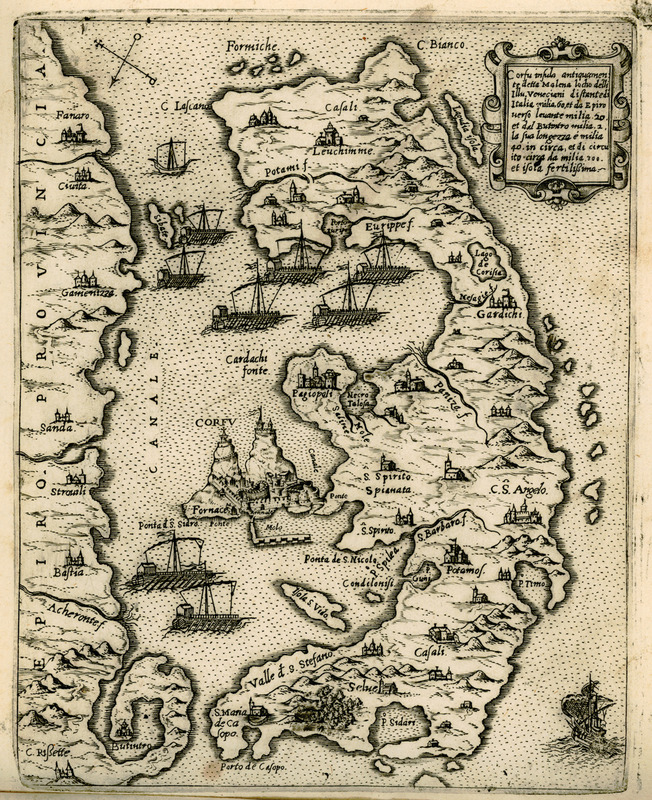 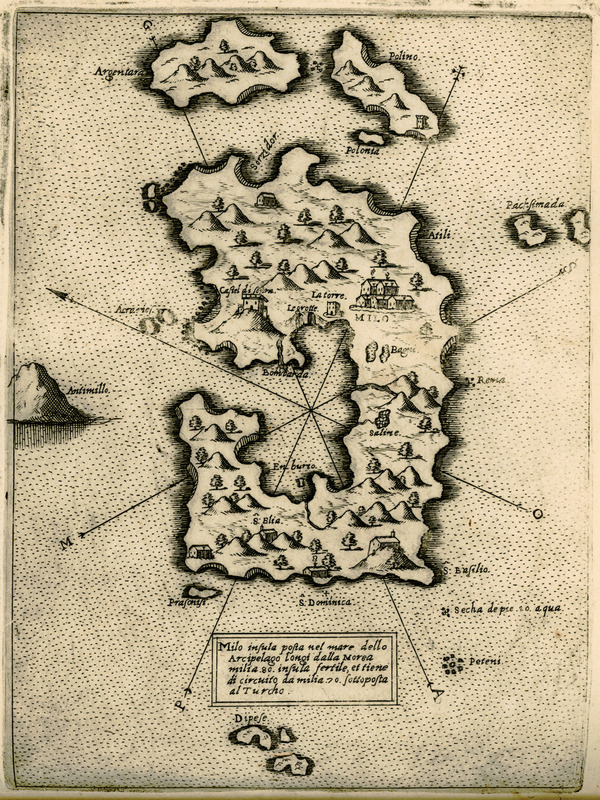 Map of Methoni, showing the place of the Venetian and Ottoman fleet during the Battle of Lepanto (1571). 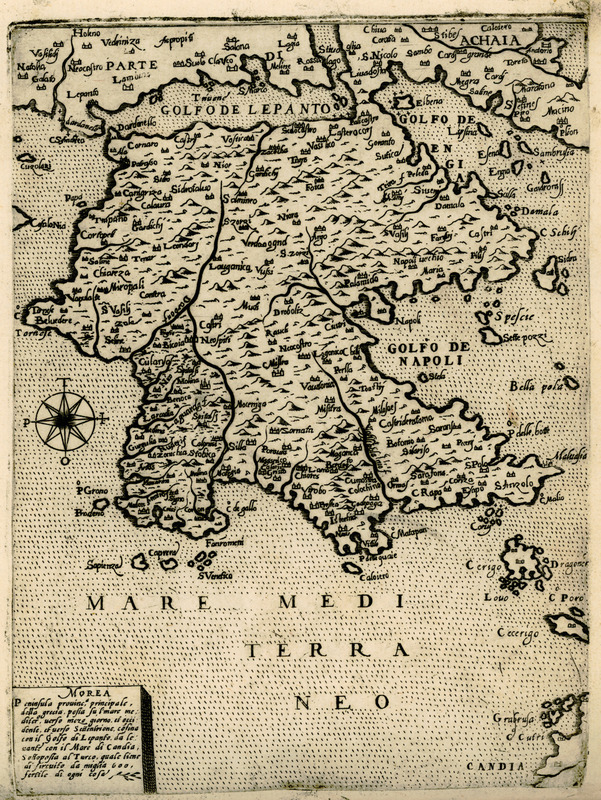 Map of the gulfs of Corinth and Patras. 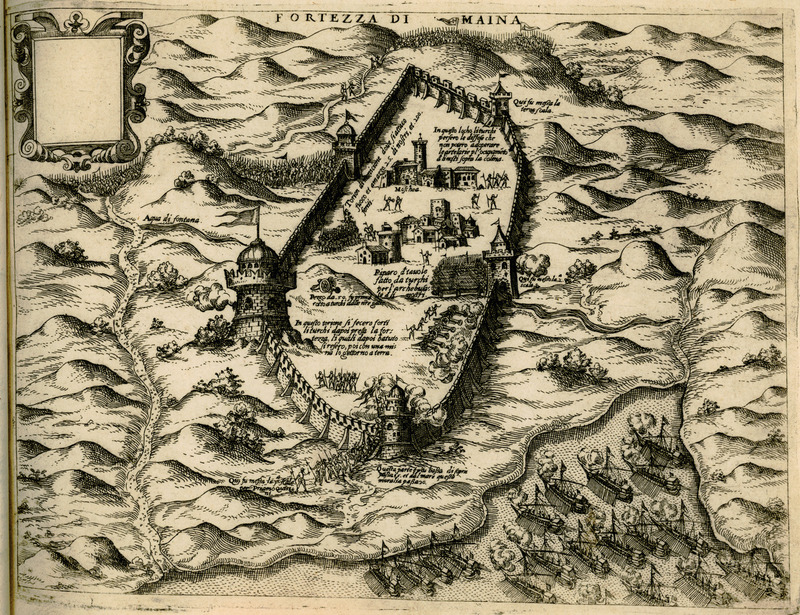 The Castle of Sopoto (today Borshi) besieged by the Venetians in 1570. 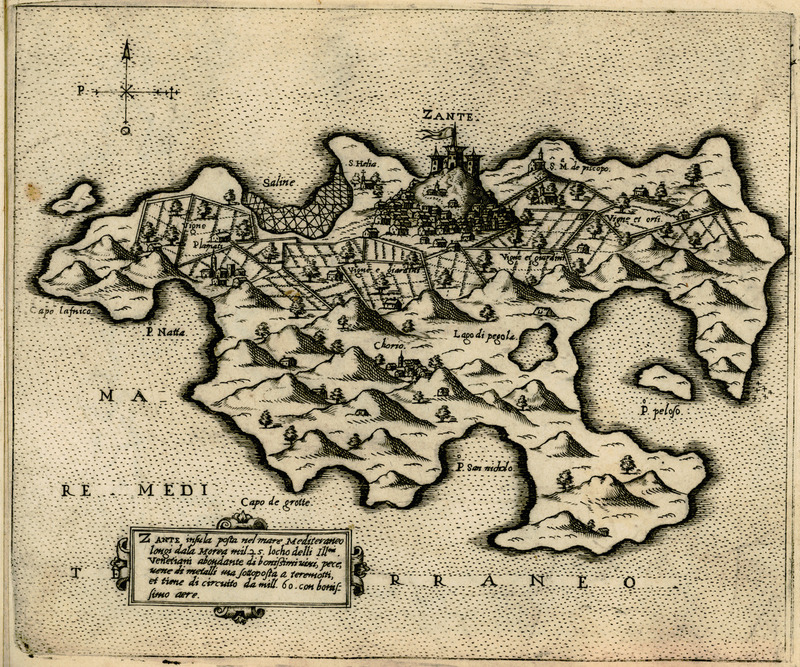 Map of the city of Hvar. 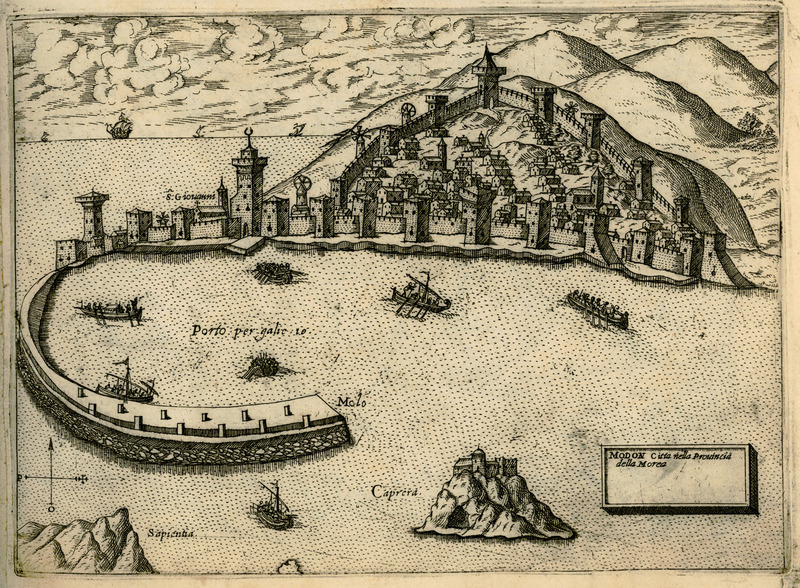 The fortress of Porto Kagio besieged by the Venetians in 1570. 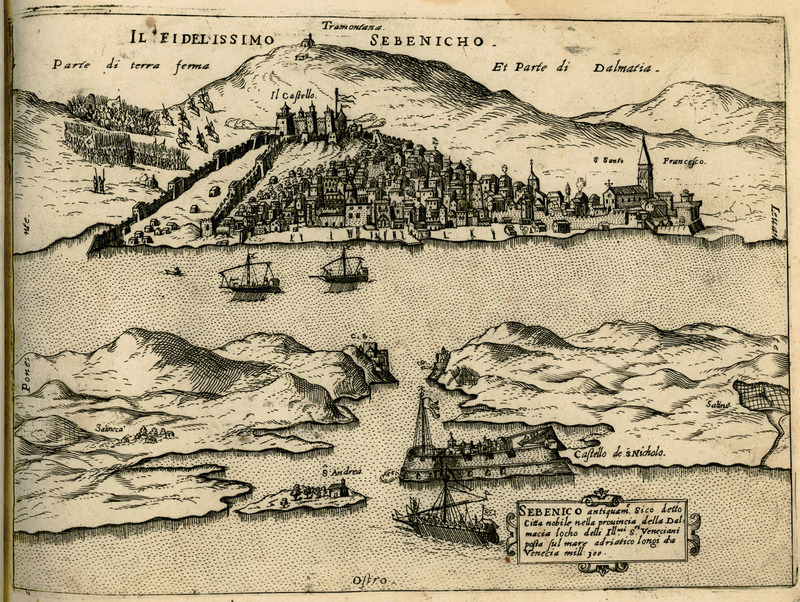 The city of Šibenik, besieged by the Ottomans and defended by the Venetian fleet in 1570. 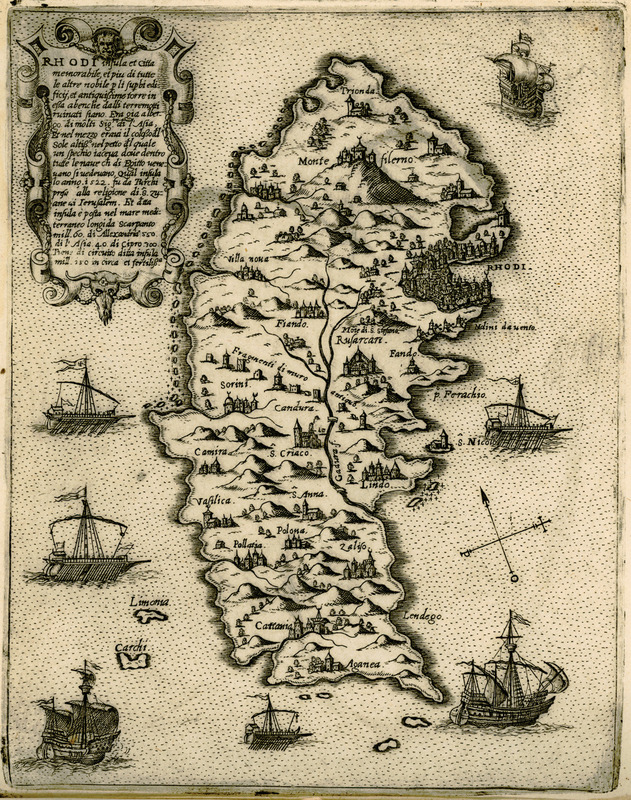 Map of the Gulf of Drin in Albania, together with the city of Shkodër. 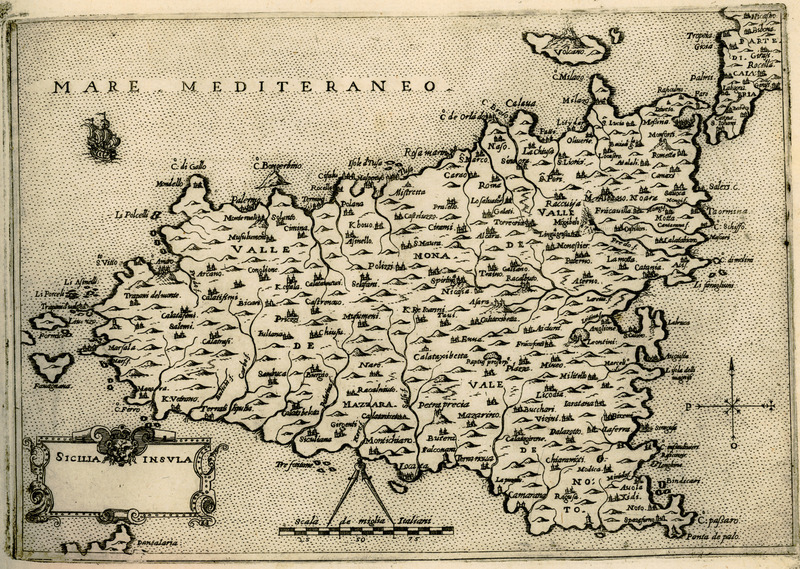 Map of the southeastern Mediterranean. 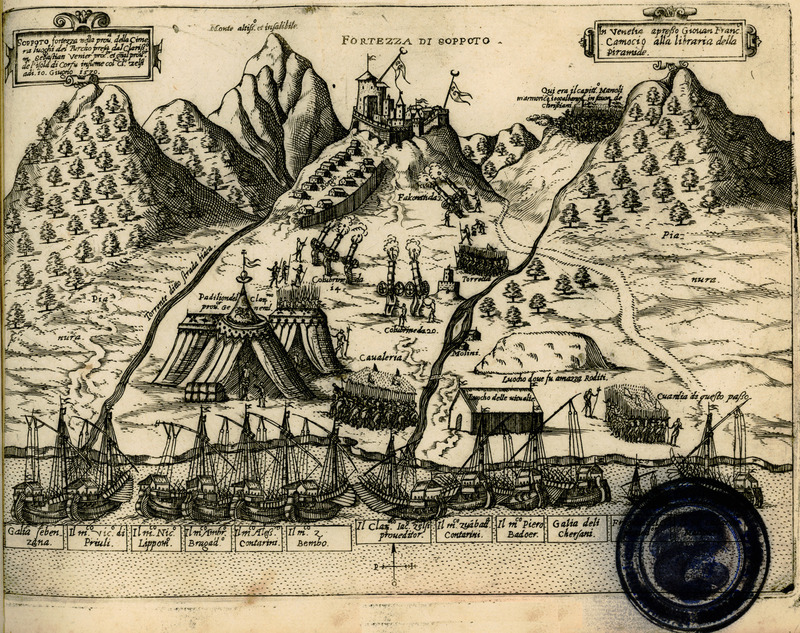 The city of Skradin while being re-captured by the Ottomans. 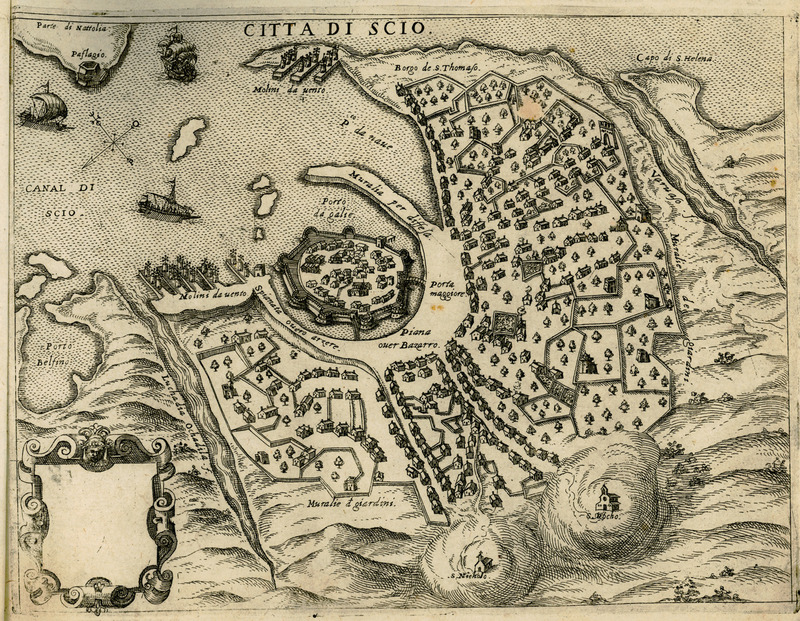 Map of Split (Croatia) and the surrounding area. 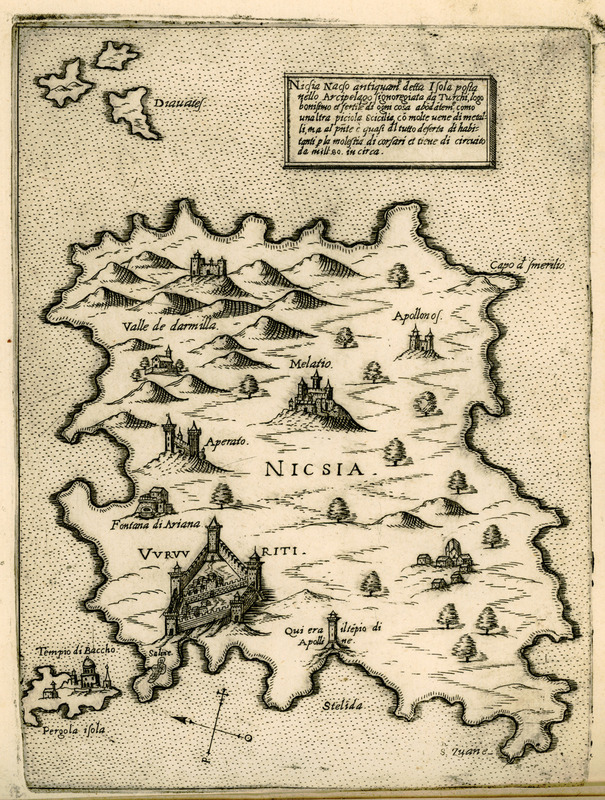 The map also shows the ruins of the Palace of Diocletian in Solin. 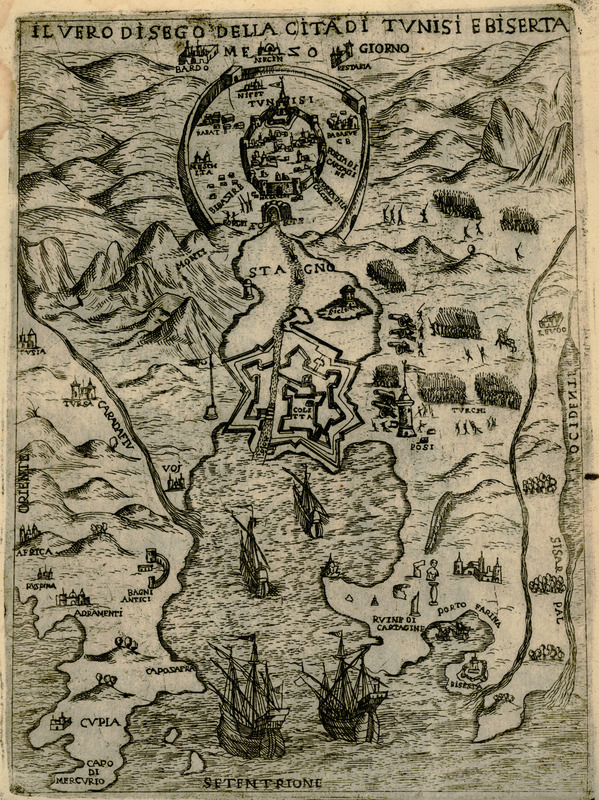 Map of Zadar under attack by the Ottomans. 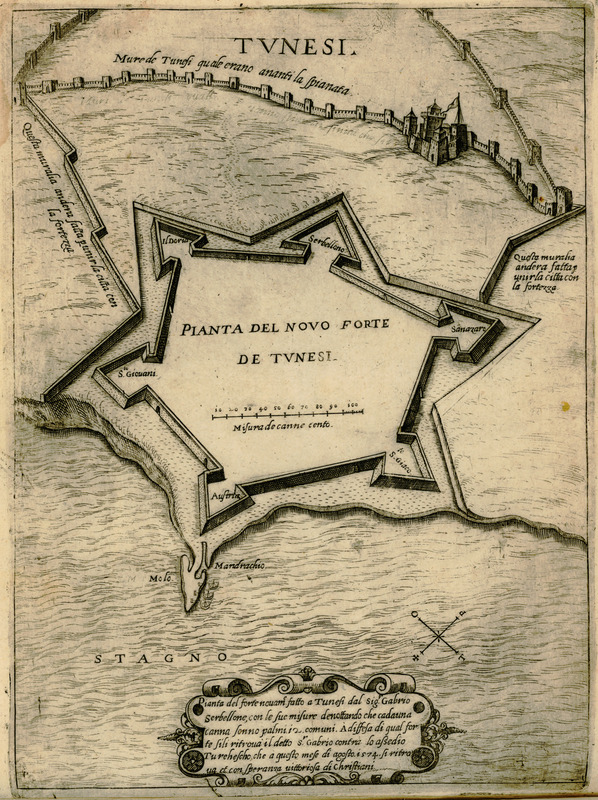 Plan of the fortress of Tunis. 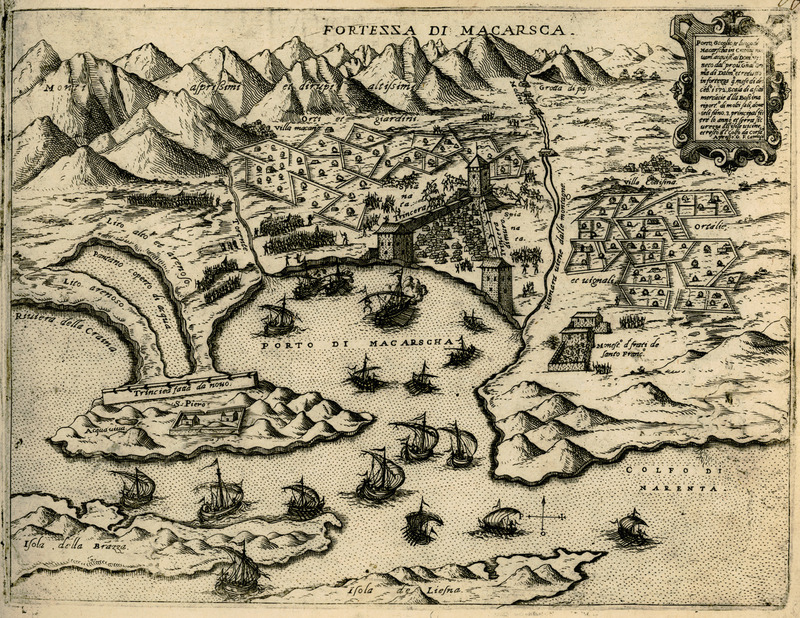 The fleet of Lega Santa (Holy League) while departing from Messina (Sicily) in September 1571. 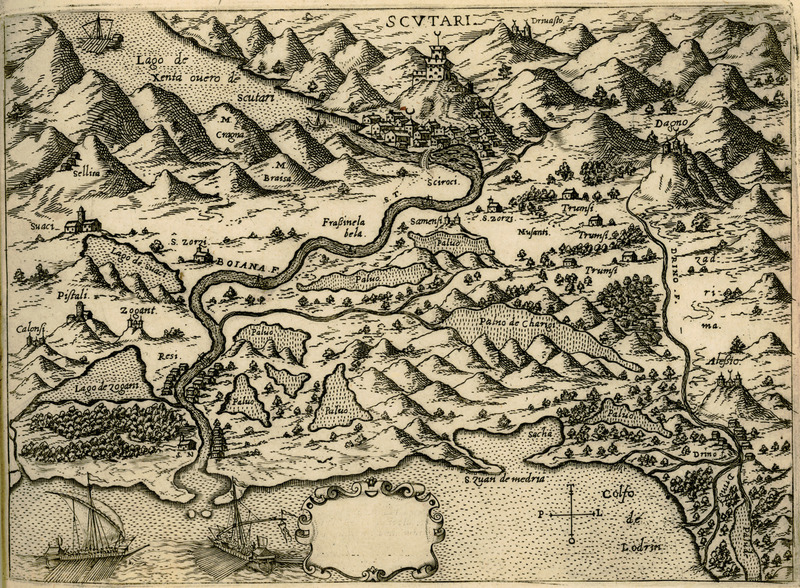 Map of Szigetvár in Hungary. 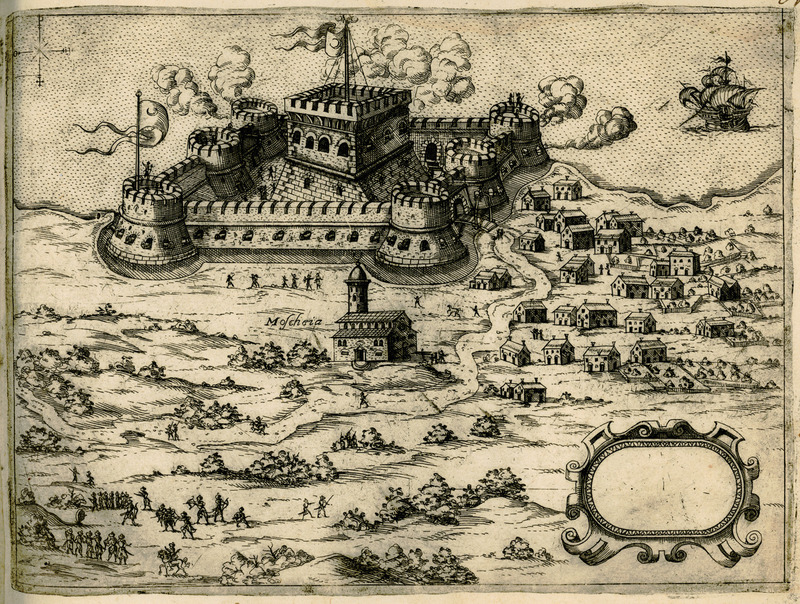 The Castle of Margariti being besieged by the Venetians (1571). 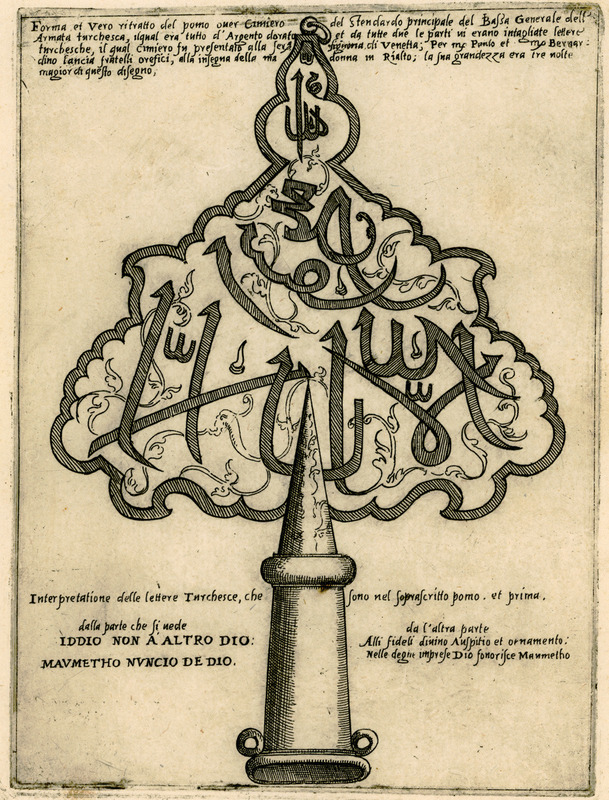 The insignia of Kapudan Pasha (the Ottoman Admiral) as presented at the Signoria of Venice after the the victory of the Holy League at the Battle of Lepanto (1571). 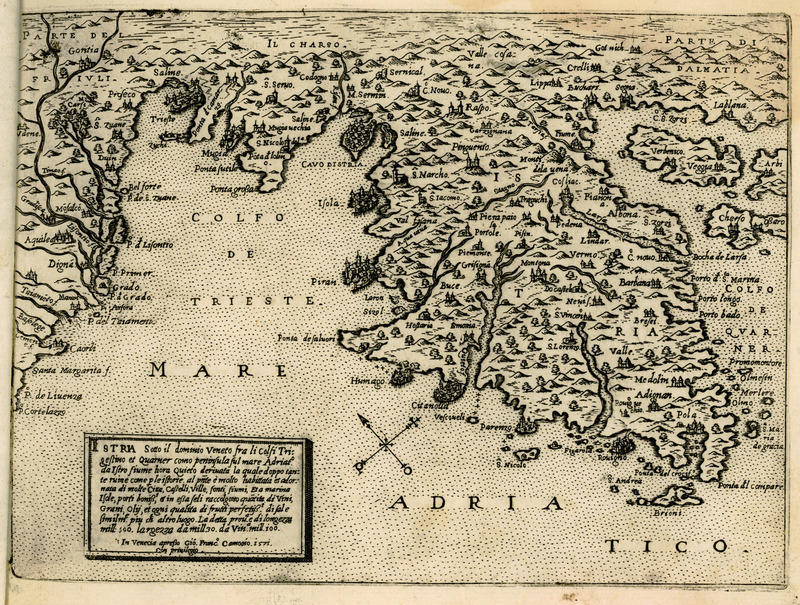 Map of Europe and Africa. 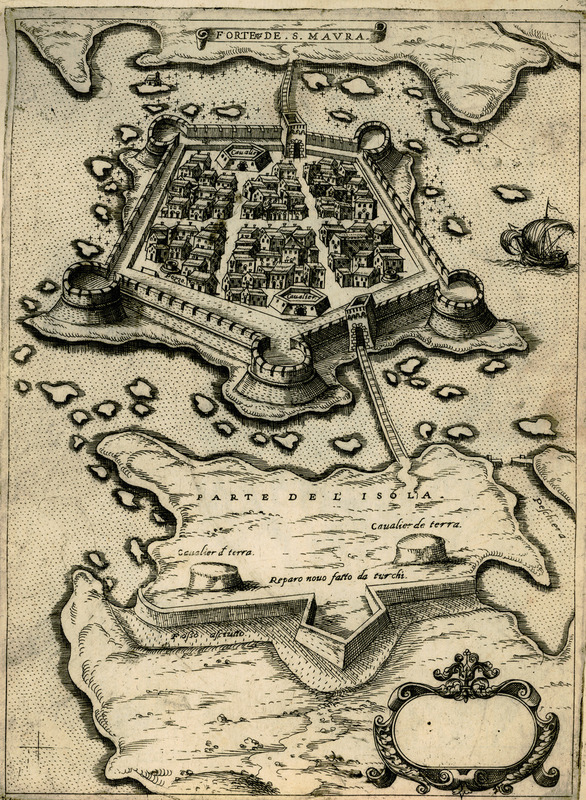 The fortress of Herceg Novi in Montenegro. 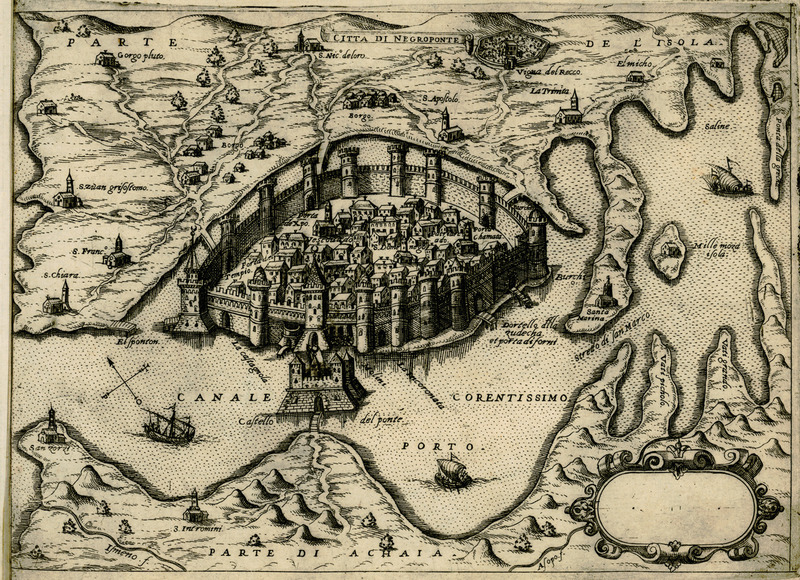 The Castle Kilitbahir on the Dardanelles. 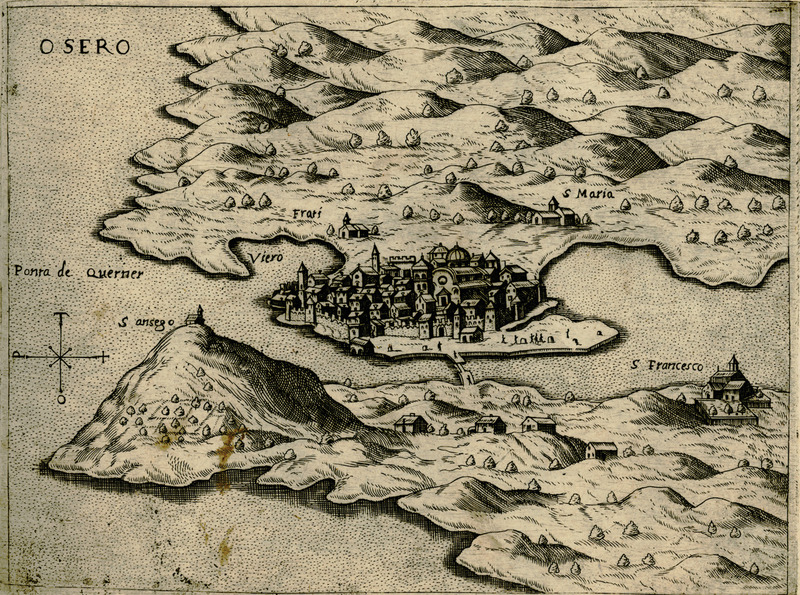 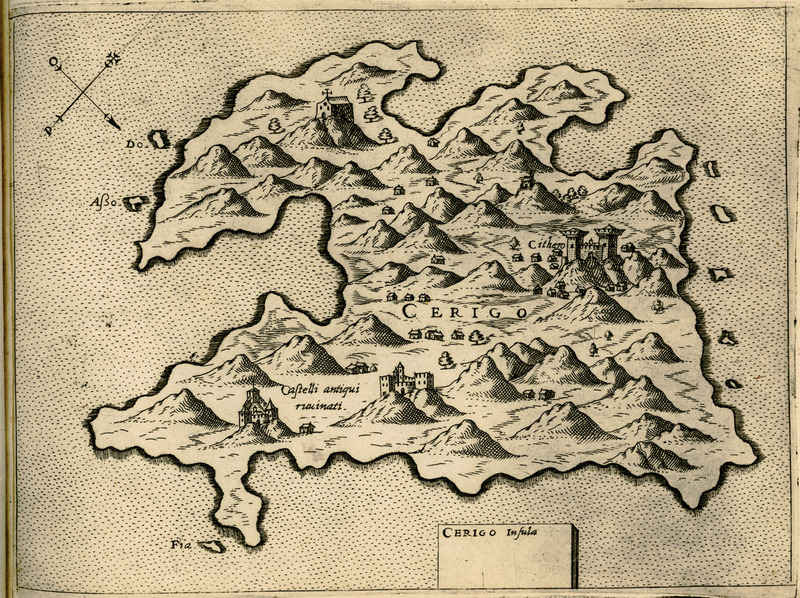 Map of the bay of Kotor with Dubrovnik (Ragusa), Herceg Novi and the city of Kotor. 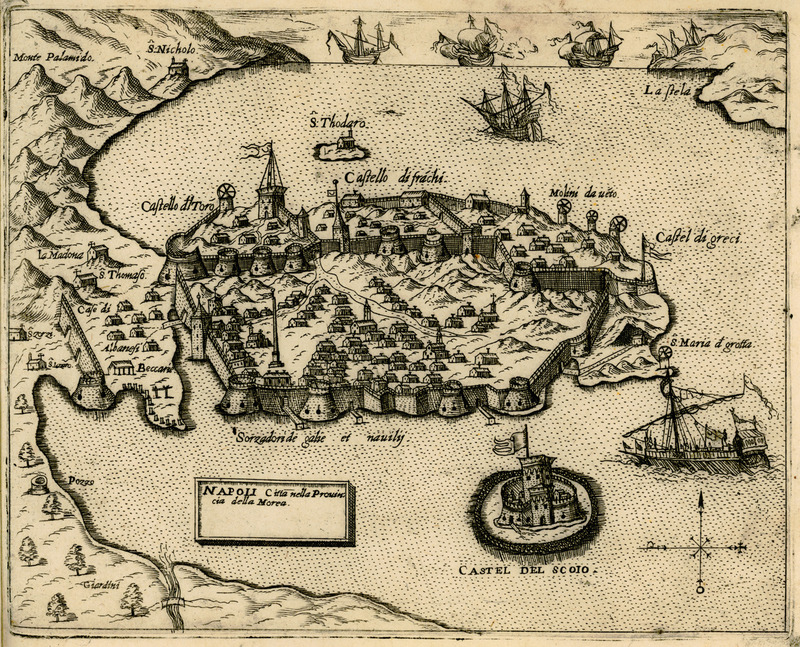 Map of the city of Chios.